Breakfast with David, a quick taxi ride, and we’re on the train to Venice. We hugged the Adriatic coast for a bit, one more view of Miramare, then went inland until we came to Mestre about two hours later. 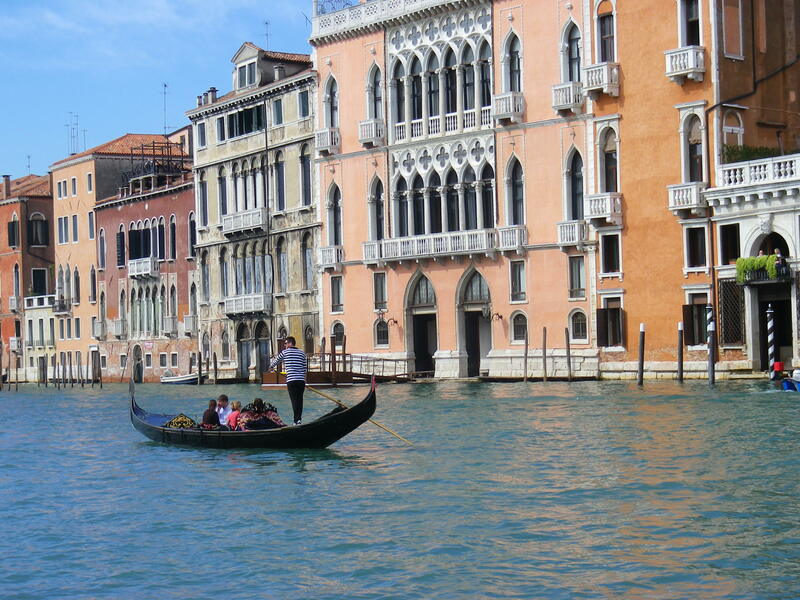 Along the causeway, and we’re in Venice, or at least in a very crowded train station in Venice. 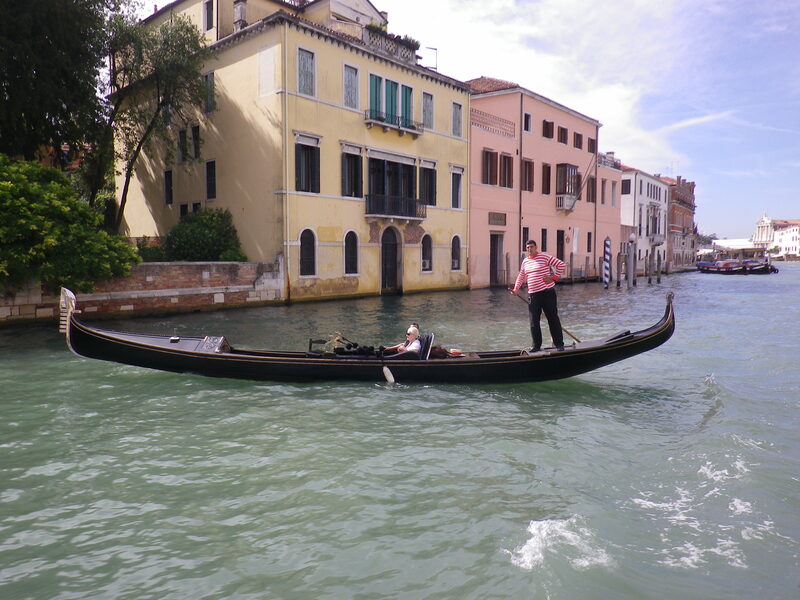 We eventually got ourselves sorted out and on the the Number 1 vaporetto, the slow boat that goes along the length of the Grand Canal. 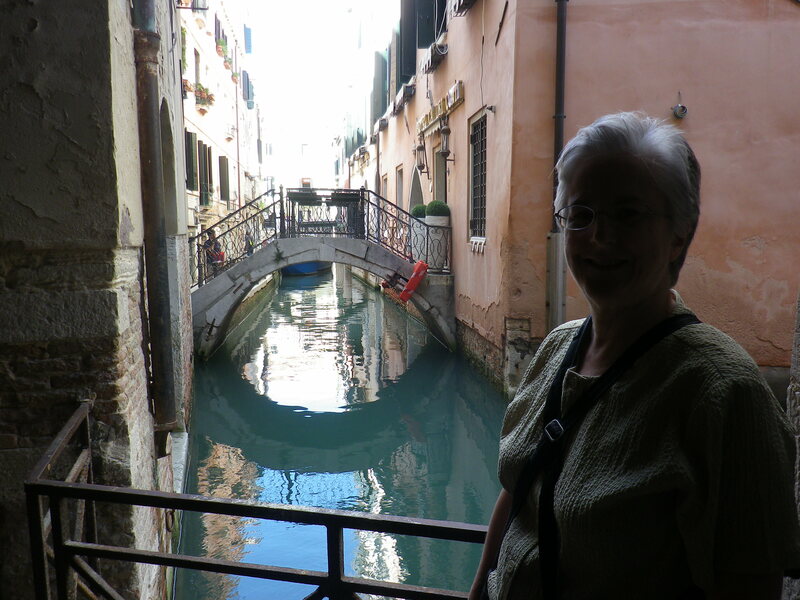 Venice is so watery! The water is green, the buildings are attractively old and often dilapidated, there is a church every hundred meters or so, and the whole thing is more photogenic than you can imagine. 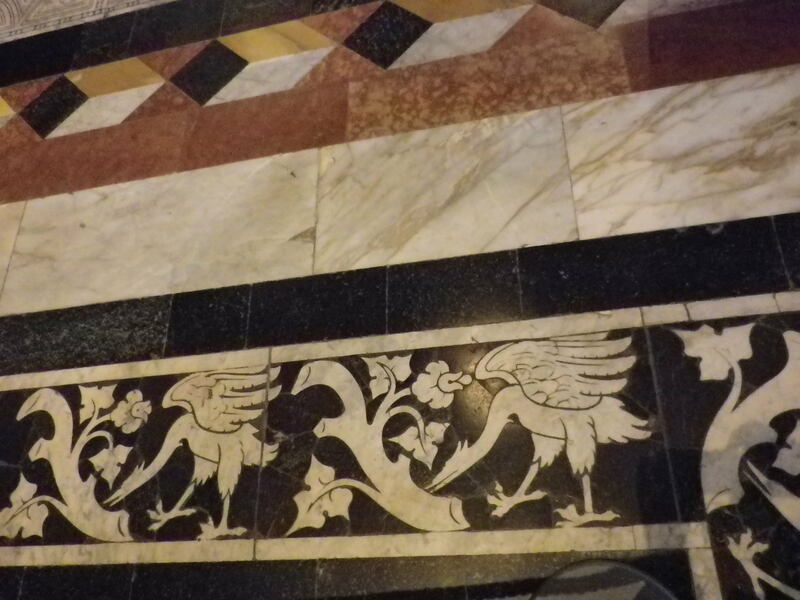 Arriving at San Zaccaria, next to San Marco, we followed the hotel’s directions along several narrow alleys (no bridges, for which we should have been thankful), to the quiet square of San Zaninovo, in the Venetian dialect, or San Giovanni in Oleo more formally. 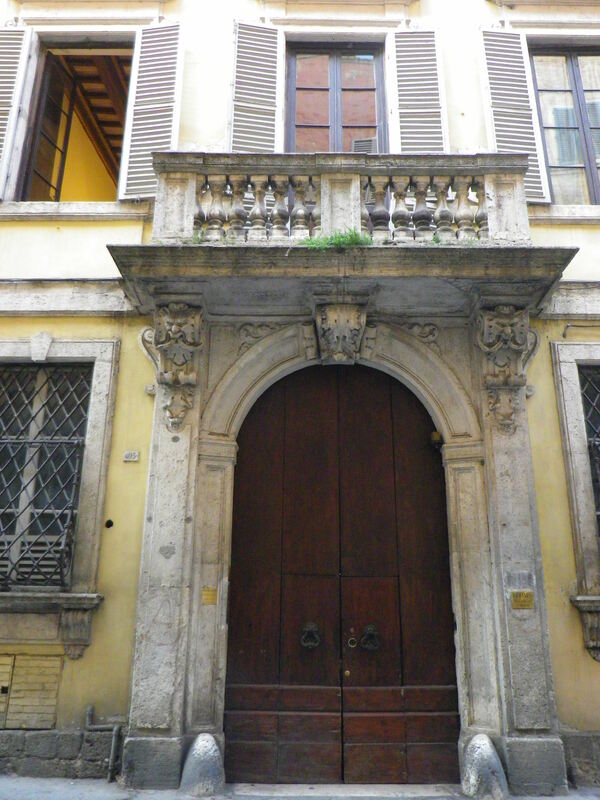 The hotel faces a church which has been closed for more than a hundred years. There’s a wellhead in the center, and to one side a sottoportego (tunnel) that leads over canals and through campi to Santa Maria Formosa, where we had lunch (an okay pizza and a glass of prosecco/campari and soda). 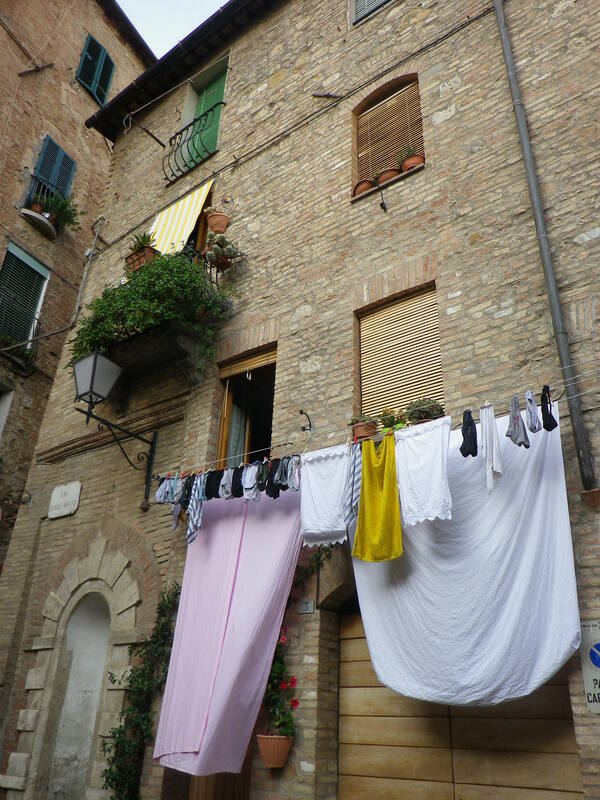 We had tickets for St.Mark’s at 3:00, so after checking in to our nice room at Casa Querini overlooking the campo, we made our way to the Piazza (there is only one in Venice). 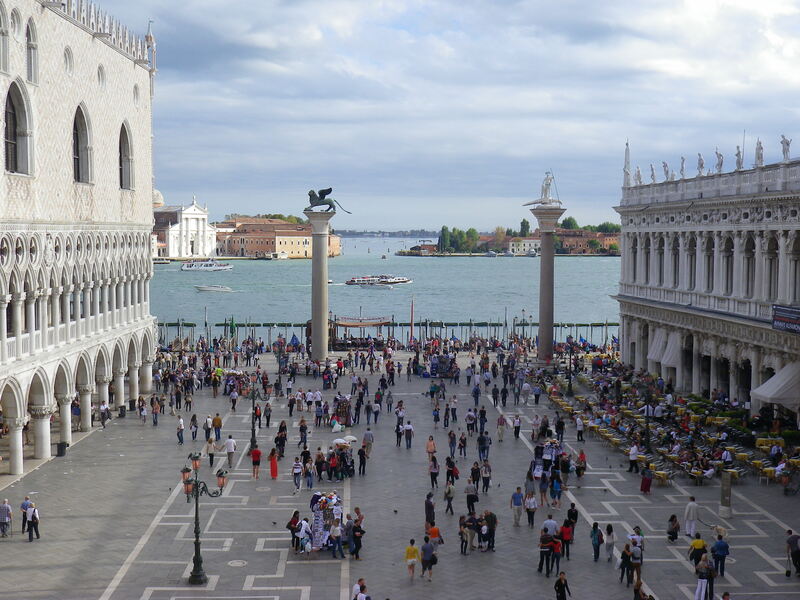 Below is a view of the Piazzetta, with the Doge’s Palace on the left and the library on the right. 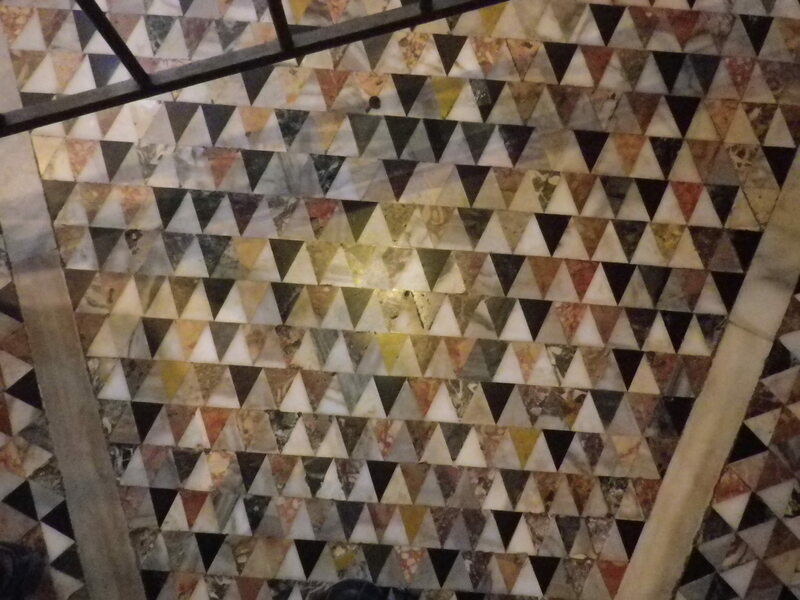 Following Rick Steves’ practical advice which we listened to on our phones, we walked through the most amazing building, with walls and ceilings covered in gold mosaics. The lights were not turned on (as we realized on our second tour, see tomorrow’s entry) but the effect was still marvelous and quite Byzantine in feeling. 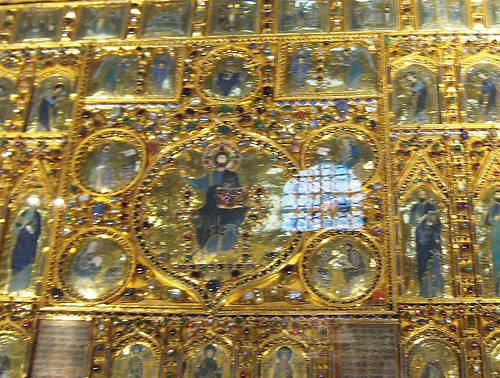 We paid the extra Euros for everything, well worth it: the Palo d’oro is a (stolen, of course) gold and enamel panel telling of St. Mark’s life, the treasury had a sweet lunetta by Paola Veneziano, and the Museum of St. Mark’s was wonderful. First you see examples of how the mosaics are made, then you have views down into the church from this upper level, then you go out on the roof in front and hang around with the four horses (copies) and enjoy the great views, and finally you see the four original horses, standing inside where they won’t be damaged by pollution. All in all, quite wonderful. 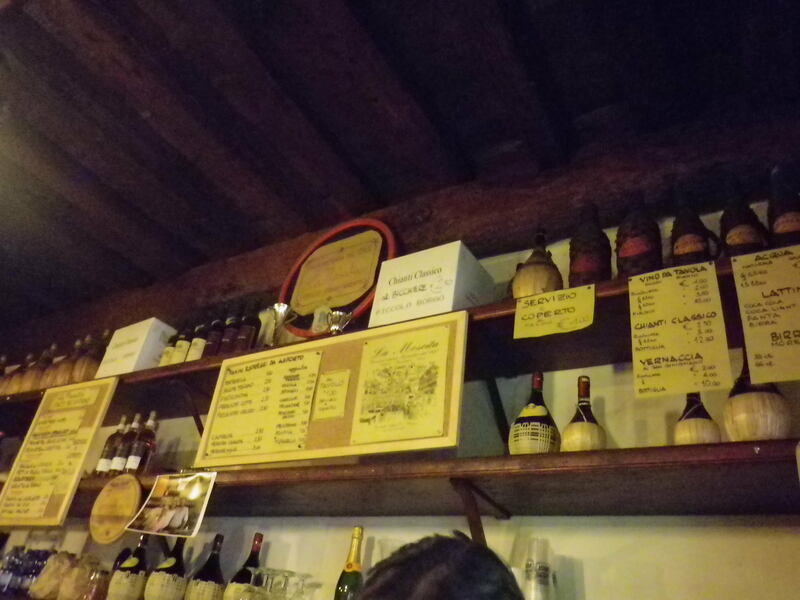 We had dinner tonight at Ae Sconto, recommended by Lynda and Frank, and enjoyed it mightily (as when have we not enjoyed Italian food?). 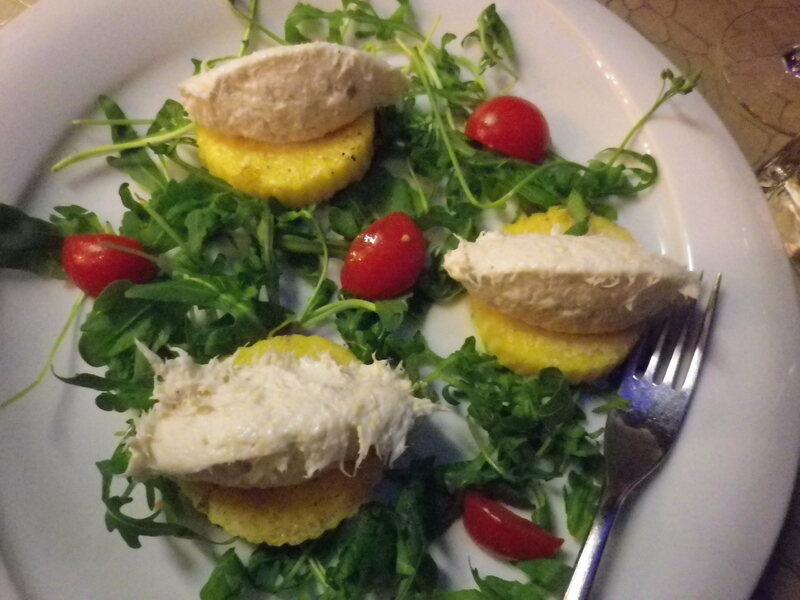 I had the creamed cod and polenta recommended by someone on Tripadvisor, which was quite good, then we shared some kind of delicious pasta. The nice people gave us a glass of Prosecco to start and limoncello to end. Divine. The next day dawned bright and warm. We had a somewhat awkward breakfast with David, who is quite kind but very hard to understand, and things like what to do with one bowl of cereal for the two of us were confusing. 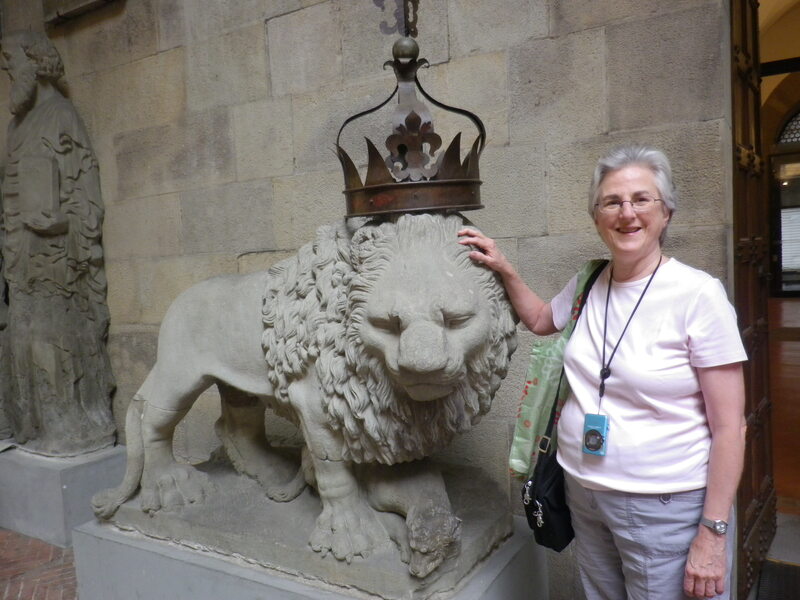 Nevertheless, we parted with smiles and good cheer, and off we went for our walking tour of Trieste. 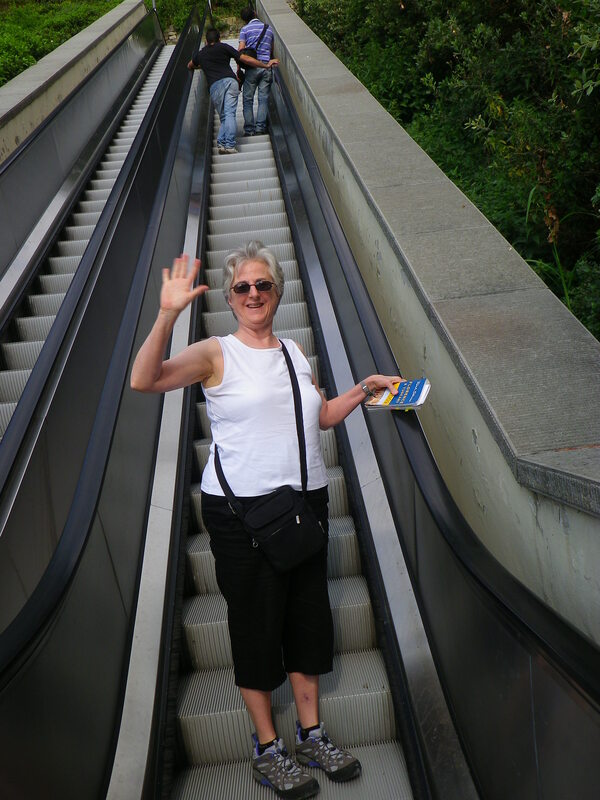 Our leader accommodated a group of German, Italian and English speakers with a bilingual Italian-English tour. 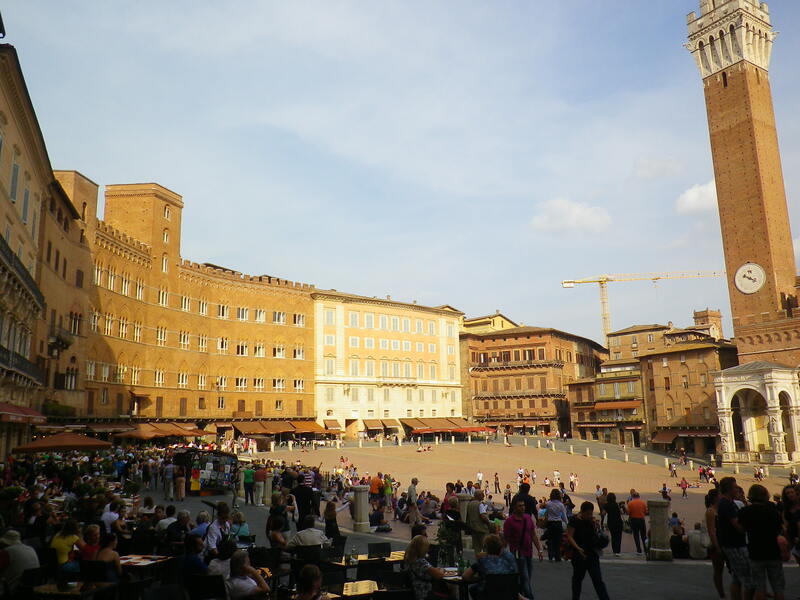 We were surprised to learn (though perhaps Jan Morris had told me this) that the Piazza had been sea until a few hundred years ago, when the Hapsburgs, i.e. the clever Maria Theresa, decided the city needed to expand and filled it in with whatever debris they could find. From here we retraced most of our steps from yesterday but with more information and a bit more energy. 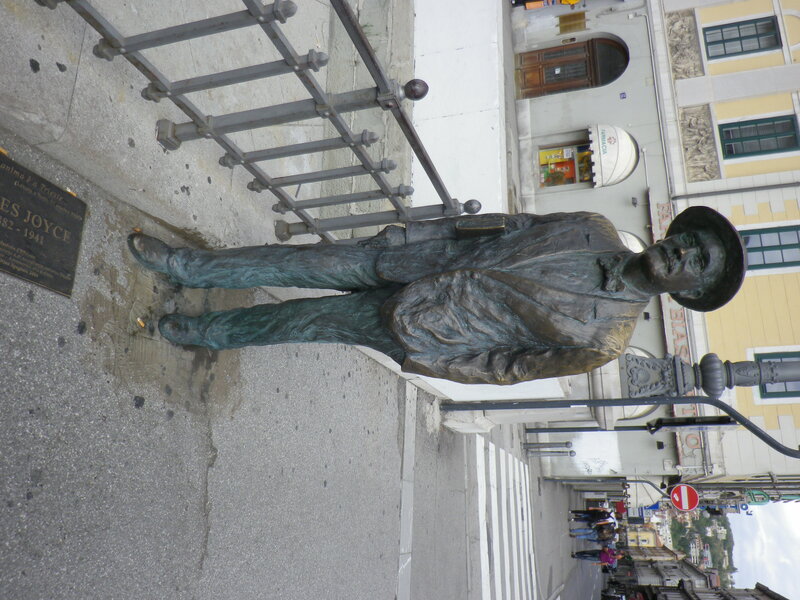 After the view of the Roman Theater, we proceeded through a pedestrian zone to the remains of the Grand Canal, another of the Empress’s ideas, and this wonderful statue of James Joyce. 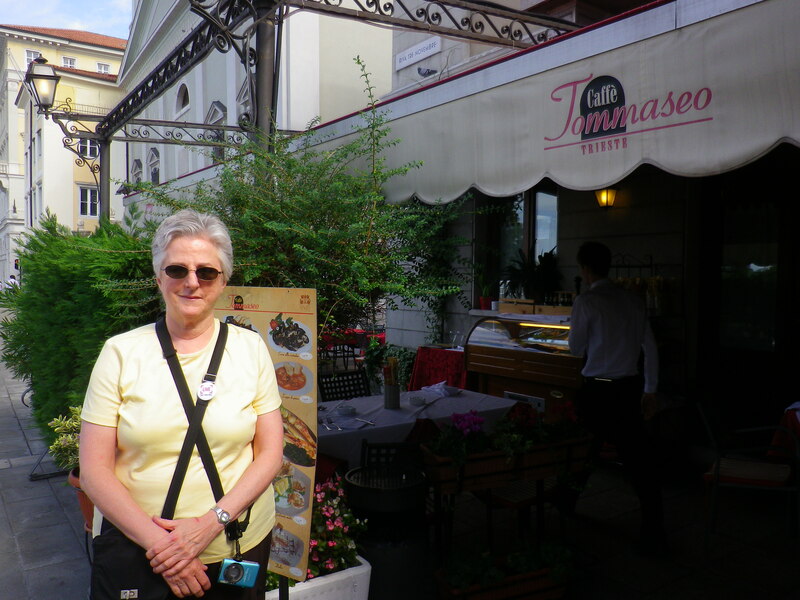 We bid farewell to the group and proceeded down the street to lunch at Cafe Tommaseo, a hangout of Joyce’s. Today it was filled with Asian tour groups, and us, sitting outside for the most delicous fish soup (me) and carpaccio, along with a glass of Prosecco. 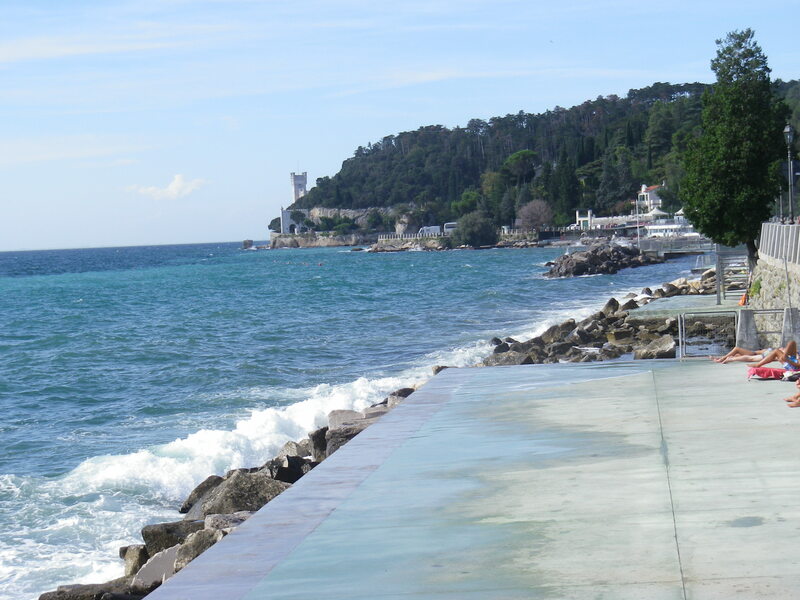 The bus stopped about fifteen minutes away from Miramare, which was a treat as we were able to enjoy the Adriatic strand. 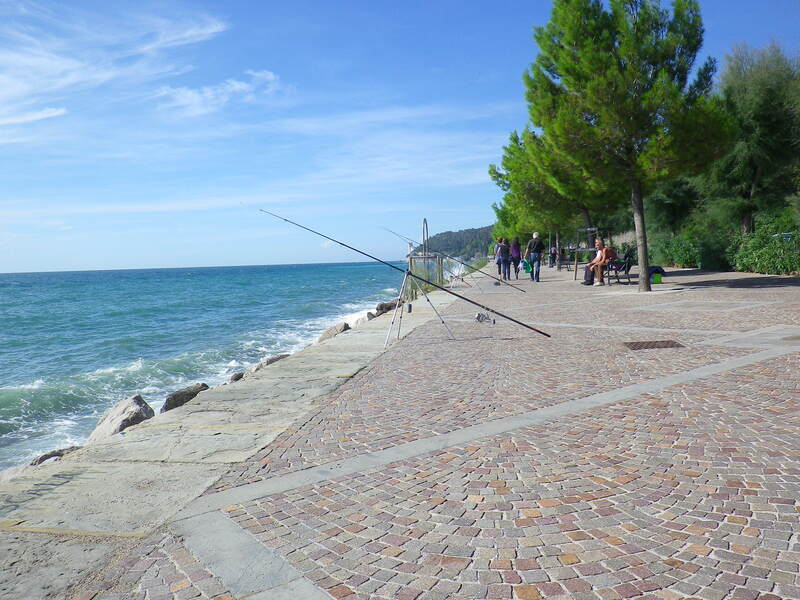 Some people were fishing, others were sunbathing on a very uncomfortable-looking concrete pad. Here’s a little clip of the Adriatic beating against the shore. We came to Miramare, paid our entrance fee (first buying the ticket, then exchanging the ticket just a moment later with a second person, who knows why) and walked through to this perfectly sited yet melancholy place. Perfectly sited because it sits on a rocky promontory jutting out into the sea and with its white stone walls can be spied from Trieste, eight kilometers away. It’s surrounded by balconies and walkways, baking in the sun, with a good breeze and the constant splash of waves on stone to mitigate the heat. Nearby are formal gardens (somewhat neglected, most of the boxwood though perfectly clipped seemed to be dead) and statuary with a little bar where you can get a coffee, a glass of wine, or a Fanta served in a curvy Coca-Cola glass. But melancholy because the poor Archduke Maximilian, whose idea this was, lived there only four years with his wife Charlotte of Belgium (whose father was the evil Leopold of Belgian Congo infamy). He was made Emperor of Mexico and sent off to a country that was embroiled in civil war and, despite what he had been told, not at all sure they wanted to be part of the Hapsburg Empire. He was shot by Juarez’s troops in 1867. After this, Charlotte returned to Miramare, where she slowly went mad. Morris makes a good story of it all. The interior is hot, stuffy, and stuffed with furniture and paintings, many of the ill-favored family of Maximilian and Charlotte. She is actually quite attractive, but the rest are nothing to write home about, especially in the mutton chop whiskers of the period. There’s a beautiful indoor fountain and great views of the Adriatic, but I would just toss out all the stuff and start fresh. That’s sort of what the Duc d’Aosta did when he lived here in the thirties. He was a dashing flying ace who reluctantly (I think) served under Mussolini and died of tuberculosis, although before he was done he became the Viceroy of Ethiopia. 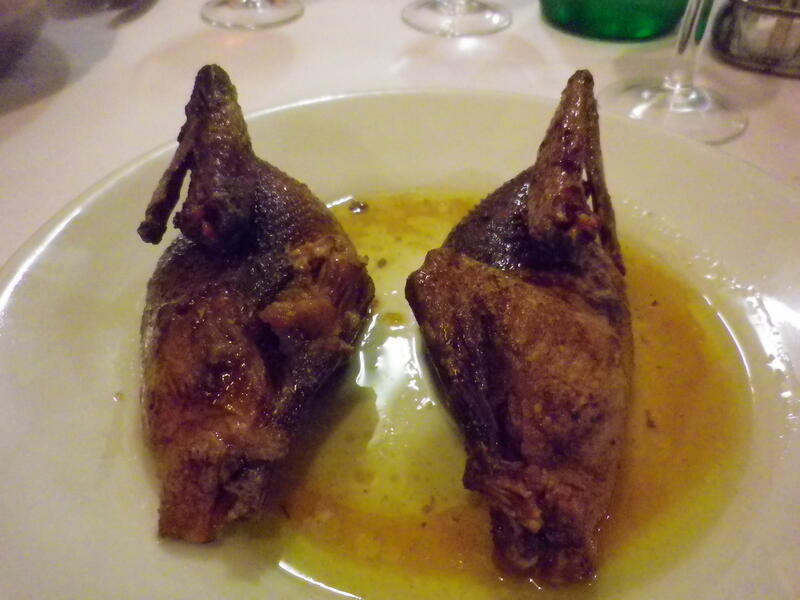 Dinner tonight was another of David’s recommendations, the Siora Rosa down near the Piazza. Very friendly service. 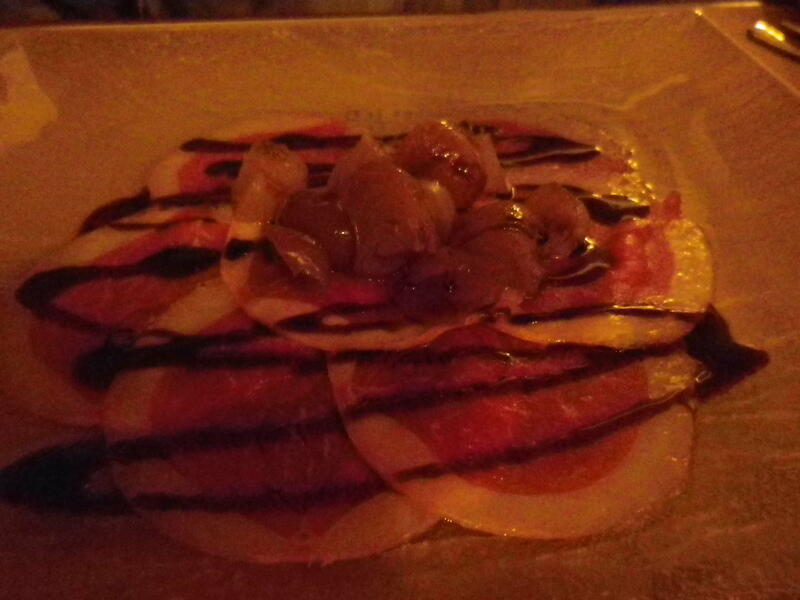 We shared a meltingly tender eggplant parmesan followed by sardines with onions and polenta for me. 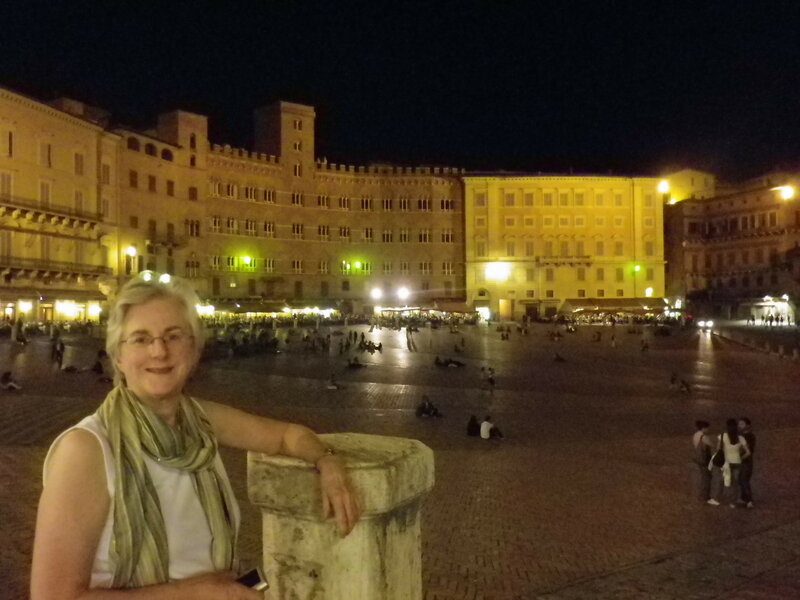 Then we walked through the Piazza to see it lit up, very pleasant, and up the hill to the Gens Julia. We had a wonderful dinner on our second and last night in Ljub, which just about made up for the lousy one the night before. Great trance music, dinner next to a goldfish pond, a friendly waiter who recommended the beefsteak, which was indeed lovely. A nice bottle of red wine- ah, civilization! Wednesday morning we packed up (luckily it all still fits, though like our clothes, it’s getting a bit snug) and trundled them off to the train station. I love trains – rarely are there delays, you know the train is going where it says it will, and all you have to do is read. We had picked up sandwich fixings in Ljub and enjoyed our rolls with Emmentaler and prosciutto while the countryside sped by. Arrived in Sezana, which is not much to write home about, with no taxis waiting and our phones not working. Finally tracked down a train man who told us to try at the hotel and, indeed, a brisk receptionist called us a cab and we were on our way. Crossing the border was entirely uneventful. No stamps on our passports for either Slovenia or Italy! Too bad. He delivered us to the train station, from which we got another cab to our B&B. The Gens Julia is up THREE flights of stairs, 77 steps as one of us noted. (Just assume we’re high up in this building.) 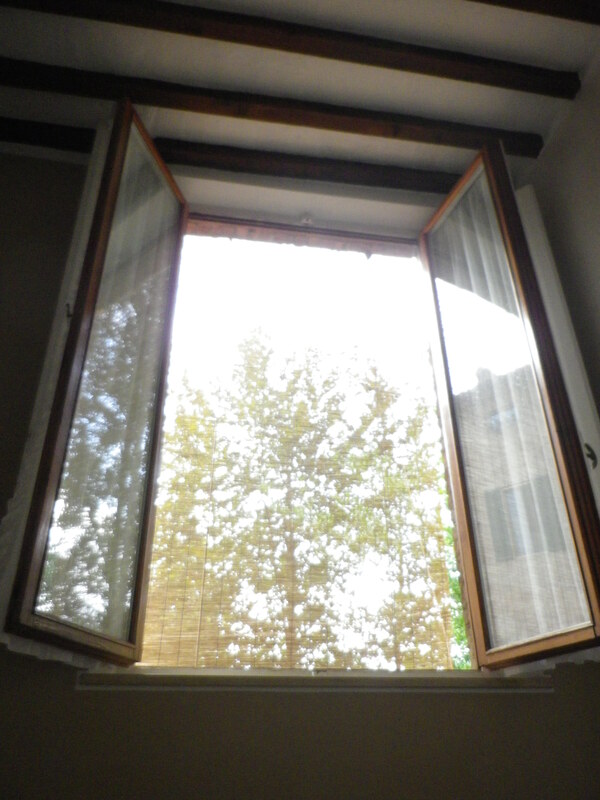 But it’s quite lovely: a modern bathroom, comfortable bed and air conditioning (!) which we may well need, as it’s warm and humid here. David welcomed us with a glass of juice and some maps and dinner recommendations, and we launched ourselves into Trieste. 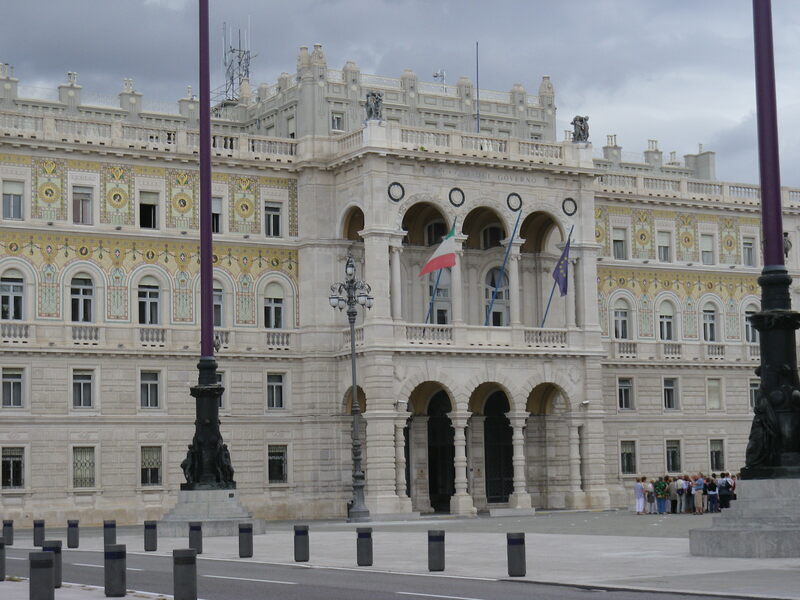 Here’s the thing about Trieste: like San Francisco, it’s built on hills, and they are very steep. 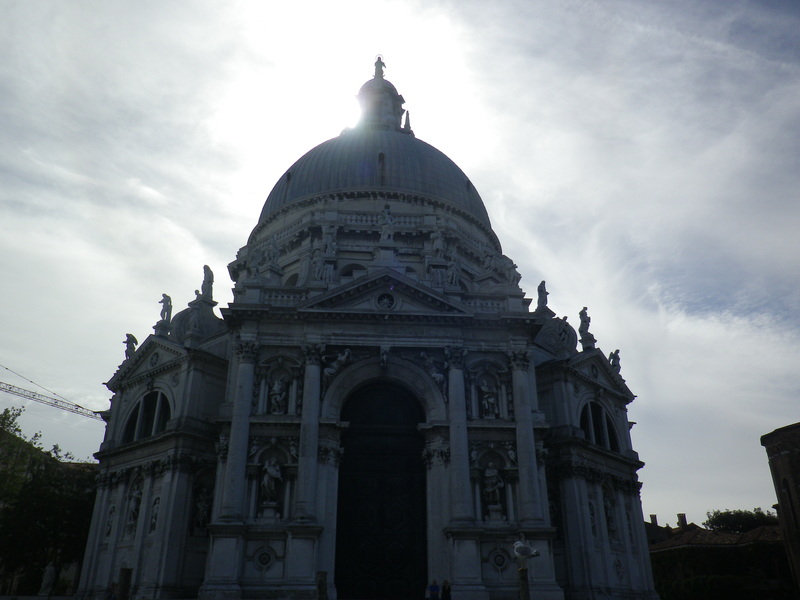 We started out walking downhill to the Piazza del’Unita, the grand square by the sea. It’s quite big and empty except for a few statues and columns. I wish I could remember what Jan Morris said about it, though I do think it’s been re-engineered over the centuries. We tracked down the TIC and got information from a somewhat testy young woman. (At one point, when I asked about the bus, she pointed out that she had already told me this – SORRY.) We were all a little testy at this point, truth be told. We’re at that point in a trip where we’re both a little weary and wondering how much longer this will all go on. But, onwards! 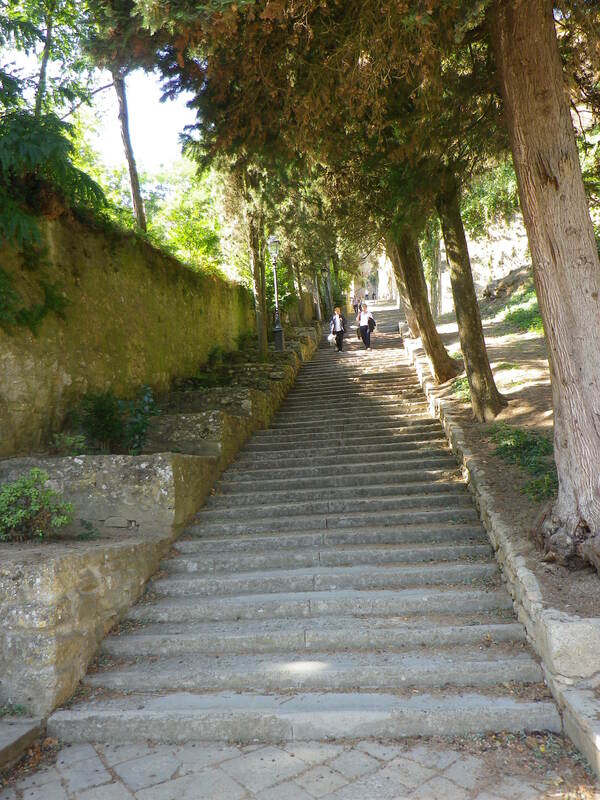 Armed with a tourist/bus ticket, we began walking uphill towards the castle and cathedral of San Giusto. 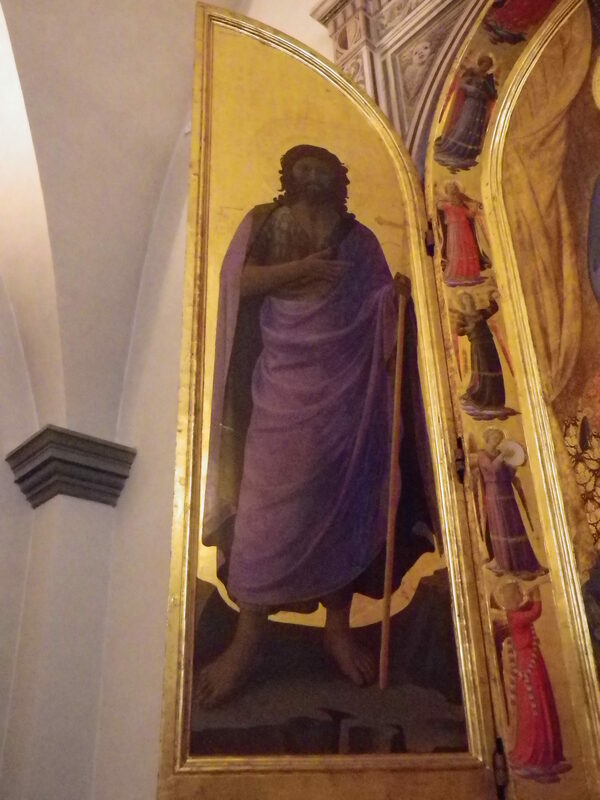 Steep hills up to an old church with a darling Jesus having a little drink, and these beautiful mosaics. The most purple one is a 1930s modern work. 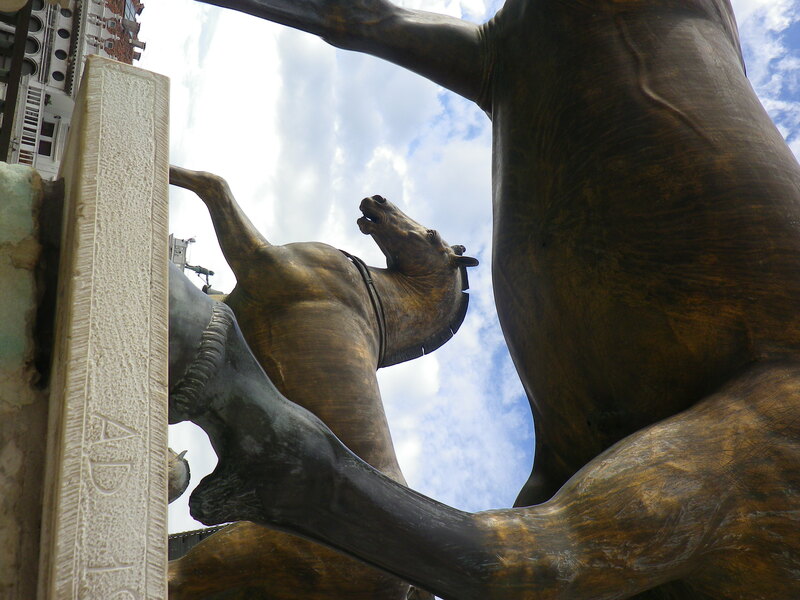 We walked in a desultory way through the castello, enjoying the views of Trieste and ignoring everything else. 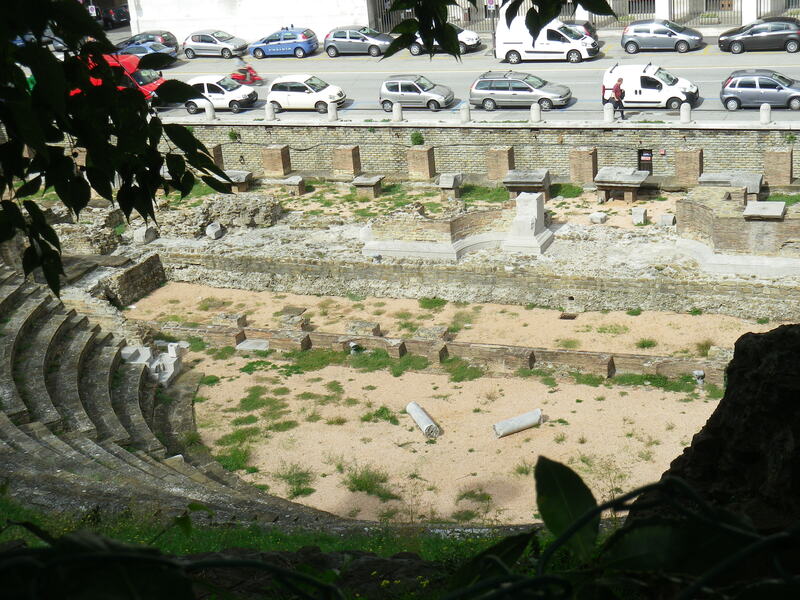 Then back down the hill to the remains of the Roman theater, which now faces the fascist-style building housing the police station. We took David’s recommendation for dinner and made our way back UP the hill to a little hole in the wall, that wasn’t open at ten of seven. We sat on a bollard around the corner, looking at the waxing moon and giving it ten more minutes, when a car pulled up and a dashing man with long hair and an elderly woman got out, unlocked the door and invited us in. The interior was brightly lit and already provisioned with table settings and baskets of bread. 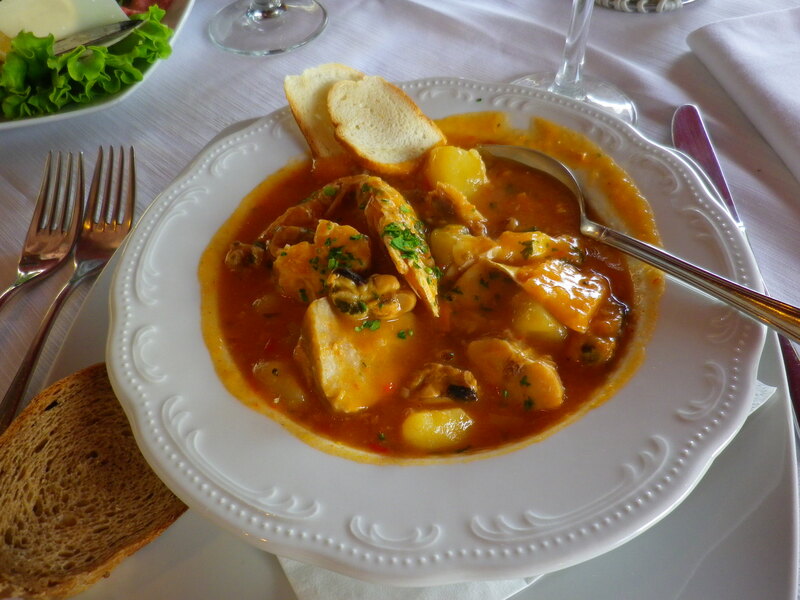 We took the nice man’s advice about what to eat and drink and ended up with a thin white wine and lots of fish. First, the most delicious fried shrimps and some other little fish, then Alison had lasagna, which was divine, while I had pasta with clams. We ended with sardines for me and something else for Alison, I’m sure it was delicious… And so to bed, in the nice cool room with the a/c running. 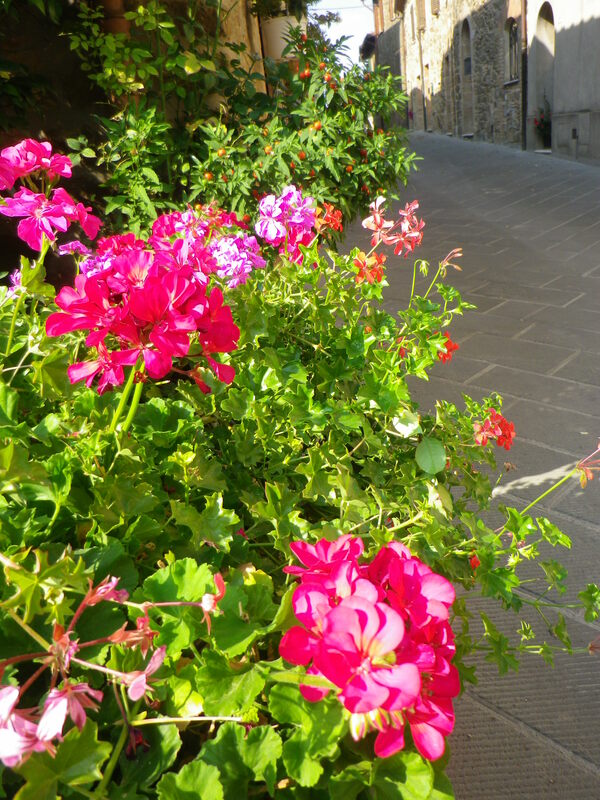 Most of the time, anyway… Although we didn’t visit any gardens, not even the Boboli in Florence (lack of time and energy, sadly), we saw lots and lots of container gardens everywhere we went. 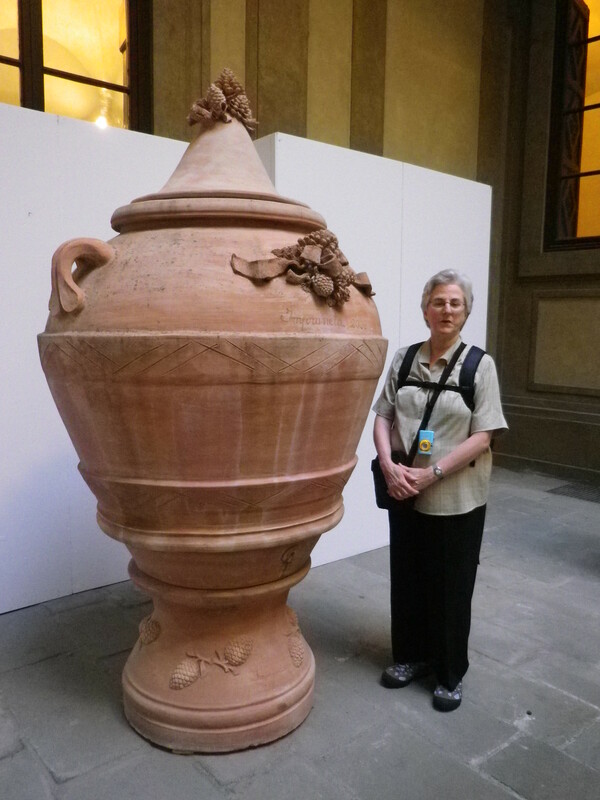 Let’s start with a huge pot from Impruneta, this one found in a courtyard at the Palazzo Riccardo-Medici in Florence. Okay, not a container garden, but it sets the tone for classic terracotta pots. 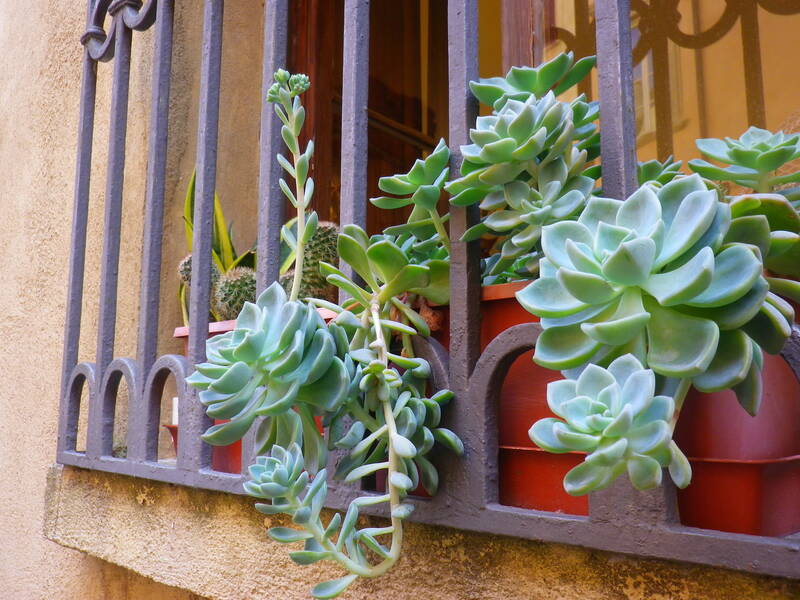 Here’s a typical balcony planting. You can see the cactus as well as the laundry drying. This is a plant I should know, clearly Mediterranean, but I’m blanking. The most amazing thing is that, as far as I can tell, it’s planted in two terracotta pots, one on either side of the doorway. 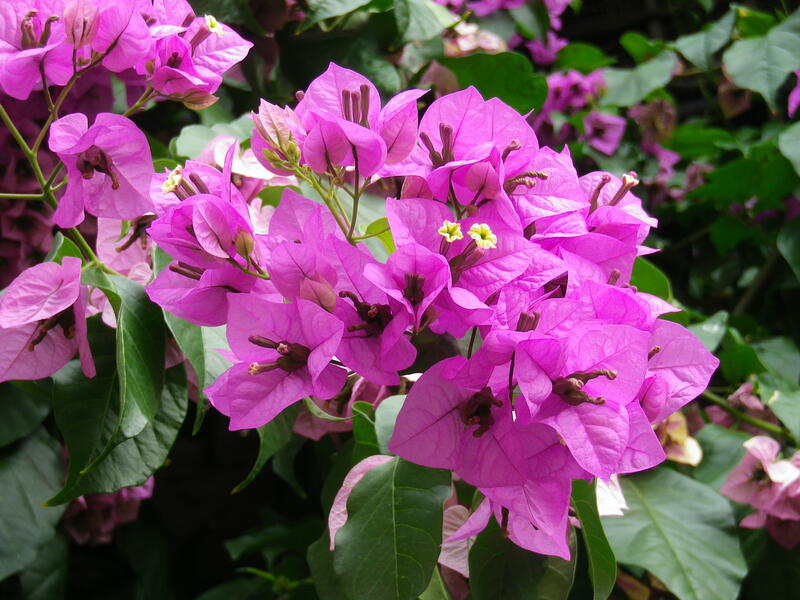 Bougainvillea?? Here’s a closeup. The flowers have almost a papery quality. 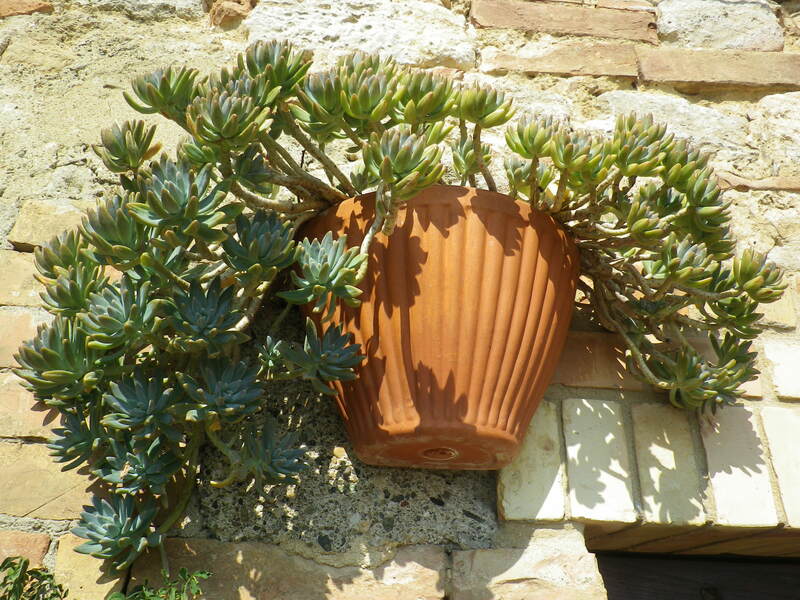 Lots of succulents, as you might imagine in this Mediterranean climate. 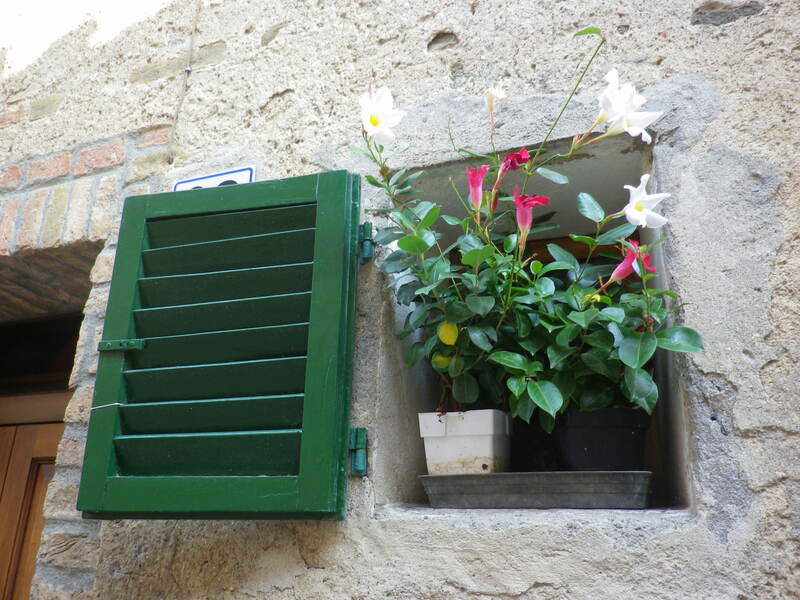 Here is a window pot in Volterra, and another one. 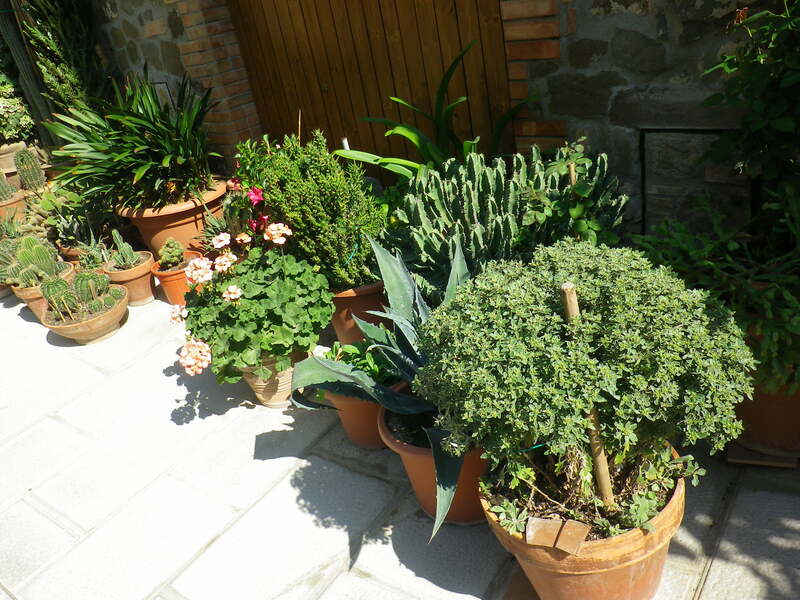 This array of xeri-plants including cactus and yucca was outside a house in Montalcino on our way into the main piazza. Below is mandevilla in a windowsill. They also had some beautiful geraniums. 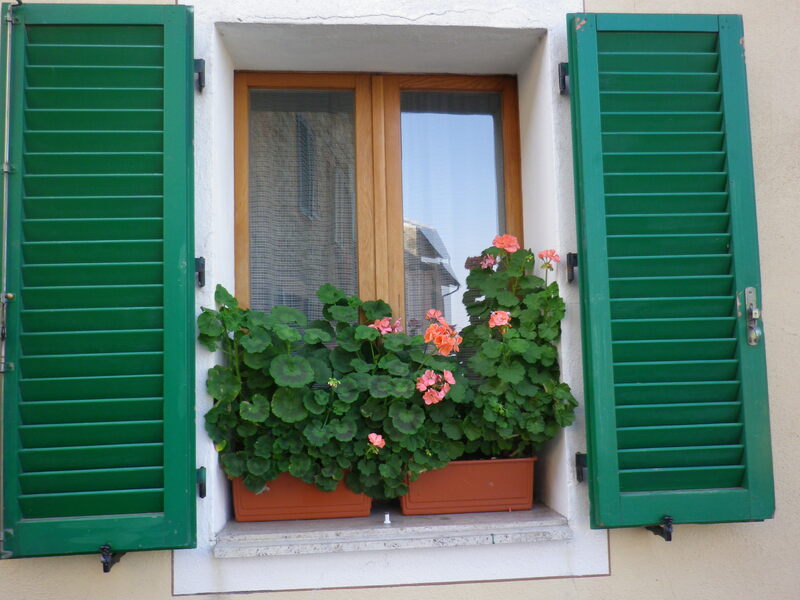 I know, you don’t usually think of geraniums as beautiful, but in this case they are perfectly proportioned and fit the color scheme of the shutters just right. 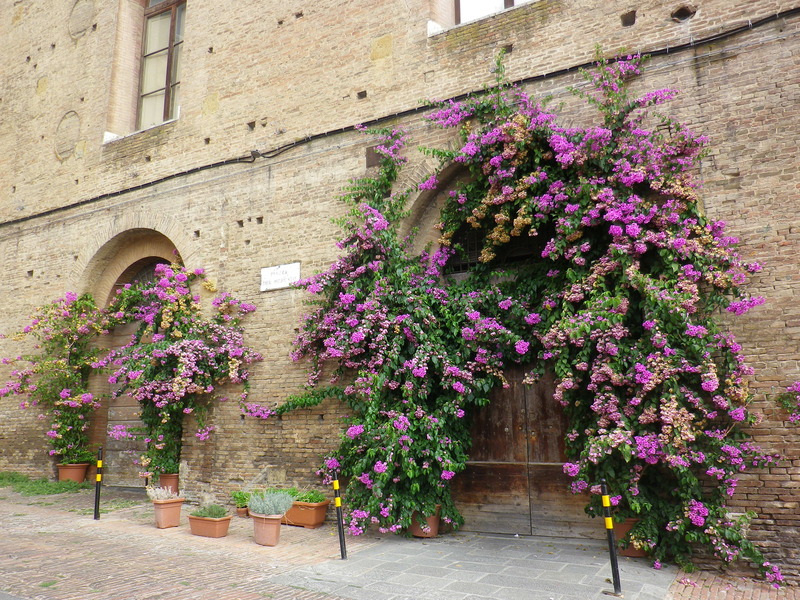 I like this shot of sprawling ivy geraniums against the view of a narrow street in Montalcino. 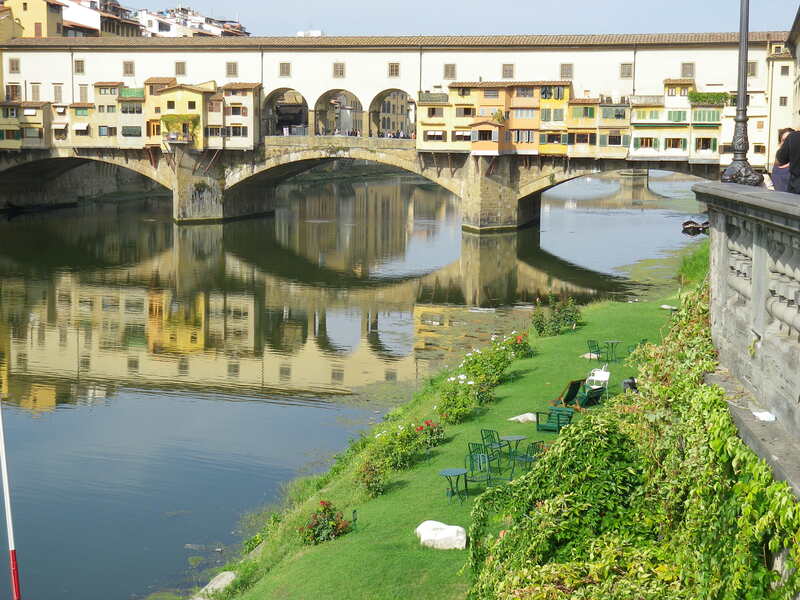 This picture was taken from the bus coming back into Florence on our last day. 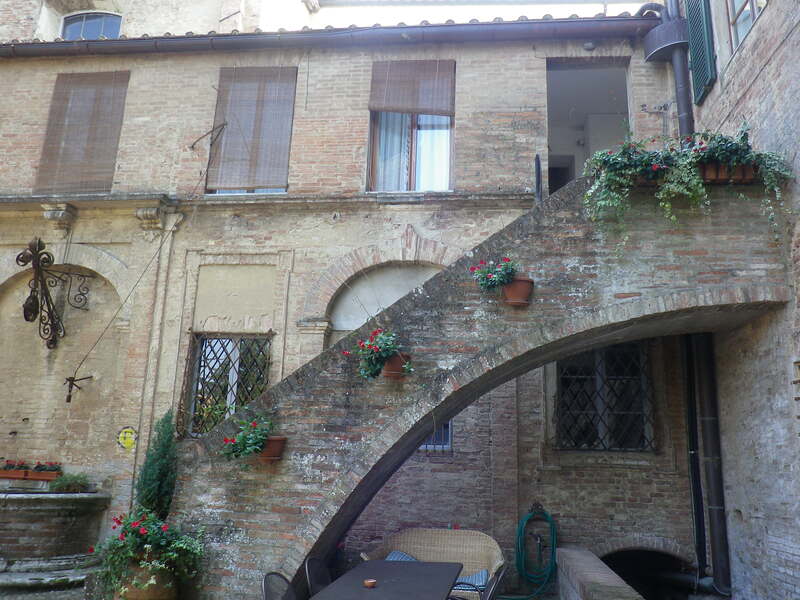 I’m not sure how the gardener waters these plants — does she crawl through that tiny little shuttered window, or does the low wall really hide an inset terrace? 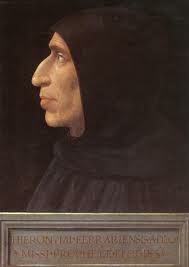 This part of Italy was settled by the Etruscans, or the mysterious Etruscans, as they were better known. 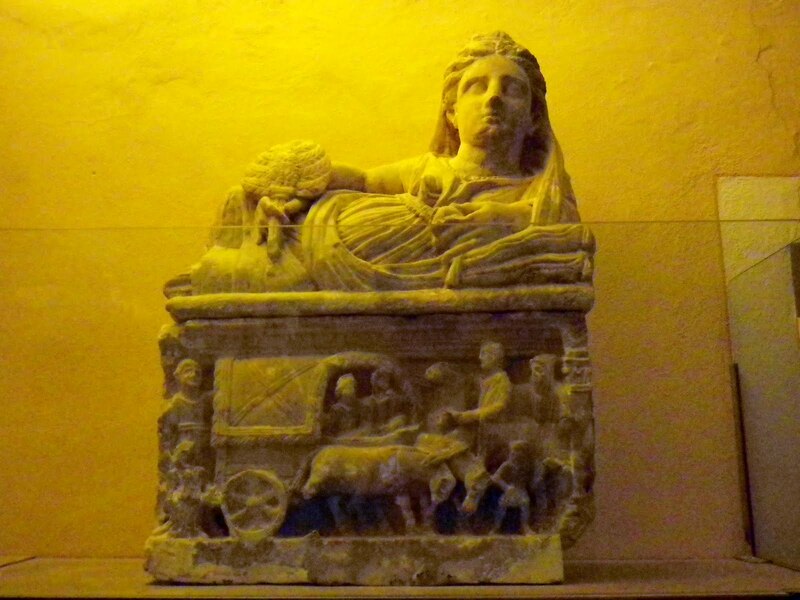 They liked food and drink, and to prove it they left behind funerary urns decorated with what look like real people, portrayed lounging on couches as they eat and drink. 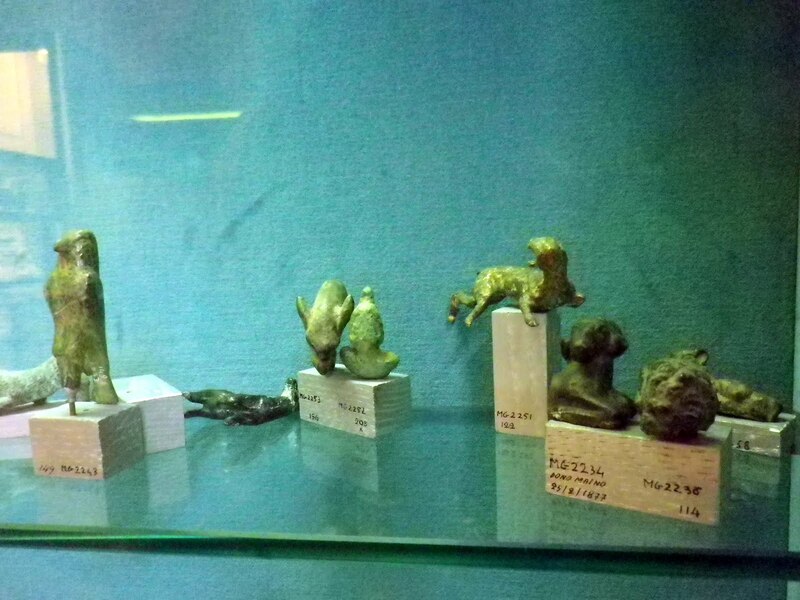 They also made tiny animal statuettes and alabaster vases, especially in Volterra, which is known for its alabaster. Their language has yet to be completely deciphered. 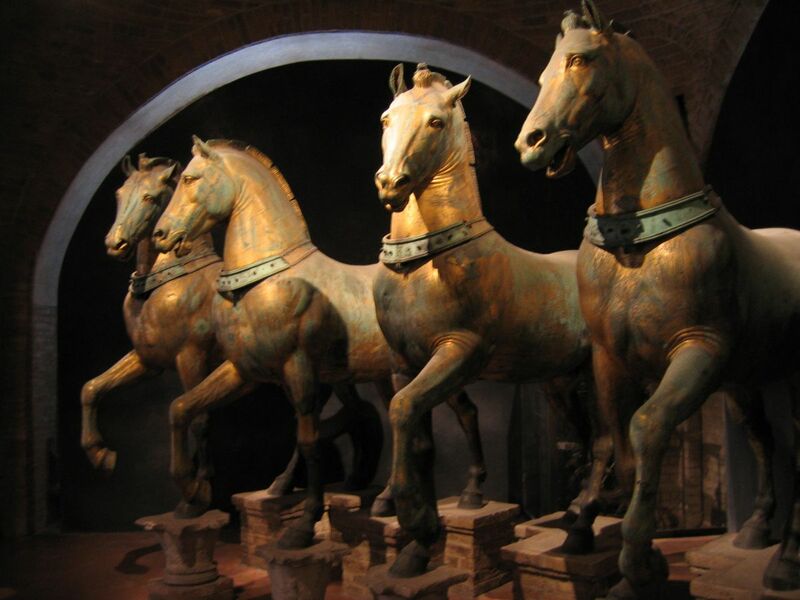 After a thousand years of prosperity in Tuscany, they were defeated by the Romans. 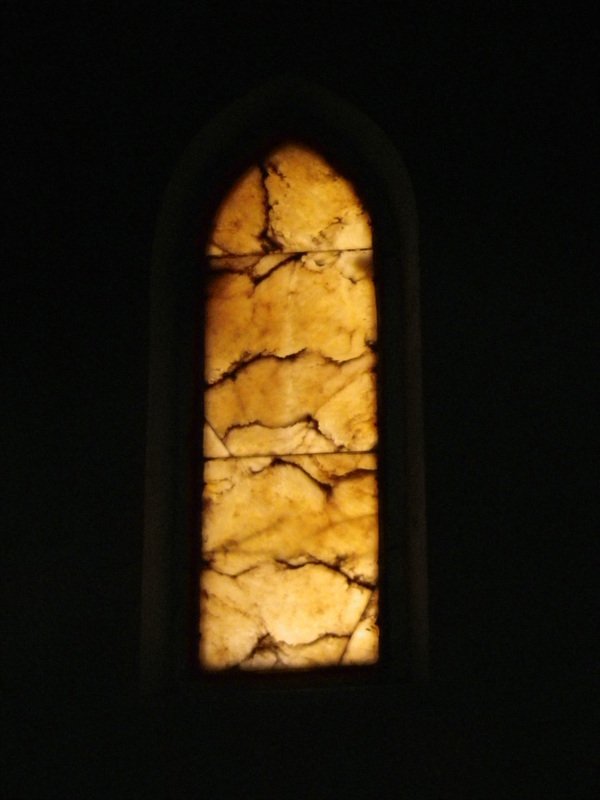 A side note on alabaster: the windows in Volterra’s cathedral are made of alabaster, letting through a milky, soft light. 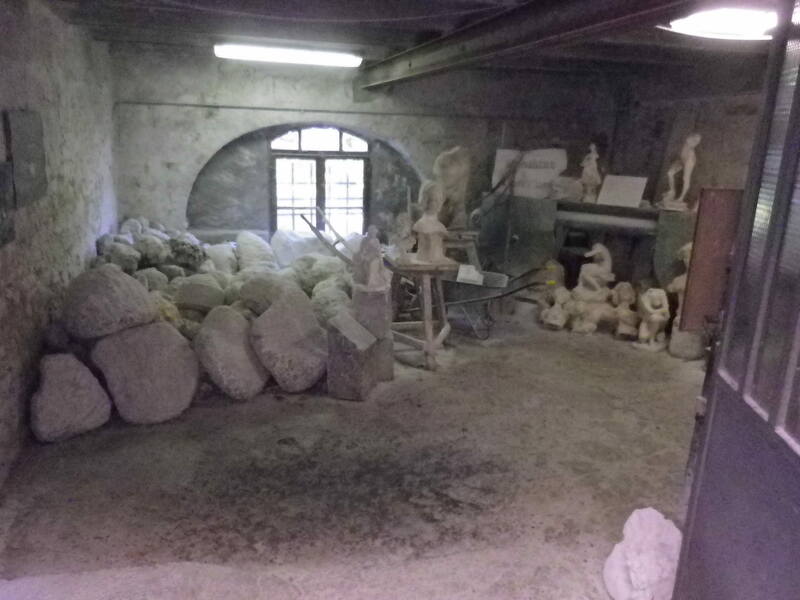 We visited an alabaster shop with attached workshop. As you can see, everything was covered with a fine, talc-like dust. The shop had some beautiful lamps and vases, but the message here was, buy something large, gorgeous and light-filled, or just pass it by. 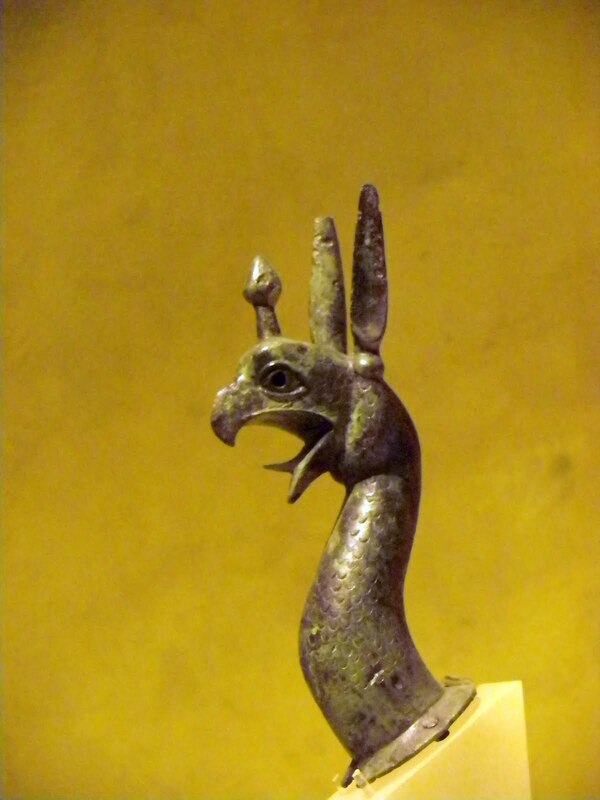 Back to the Etruscans. 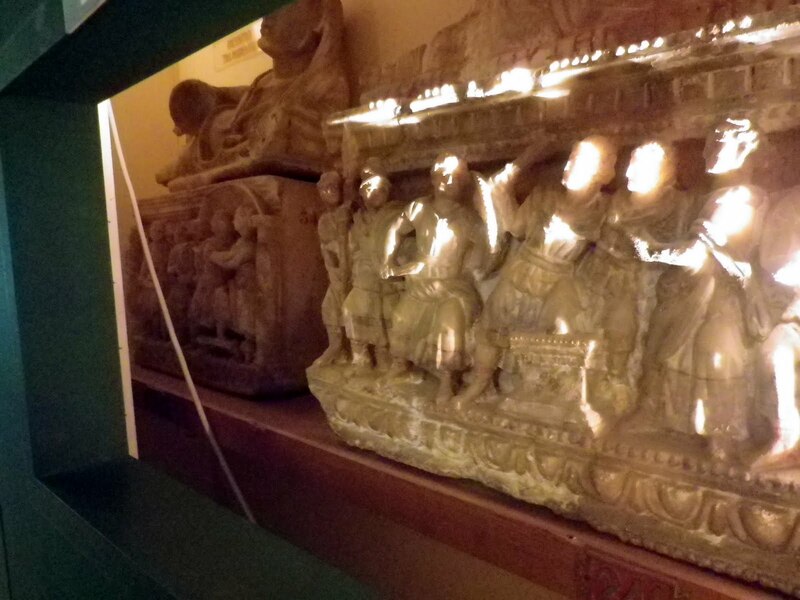 Volterra is known for its Etruscan Museum, founded in the 18th century by an abbot who was fascinated by their civilzation, and touted as the third greatest collection after the Louvre and London’s National Gallery. Well, they certainly had lots of things. 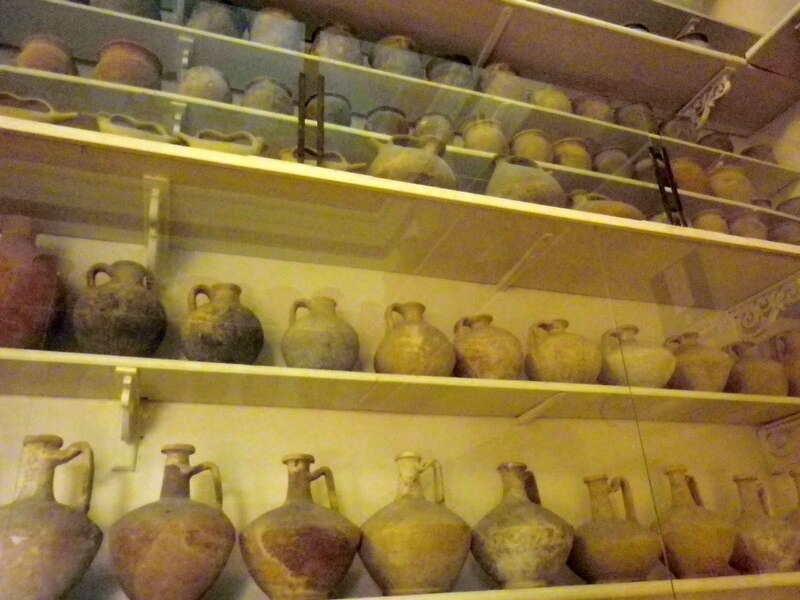 Here are lots and lots of alabaster vases. 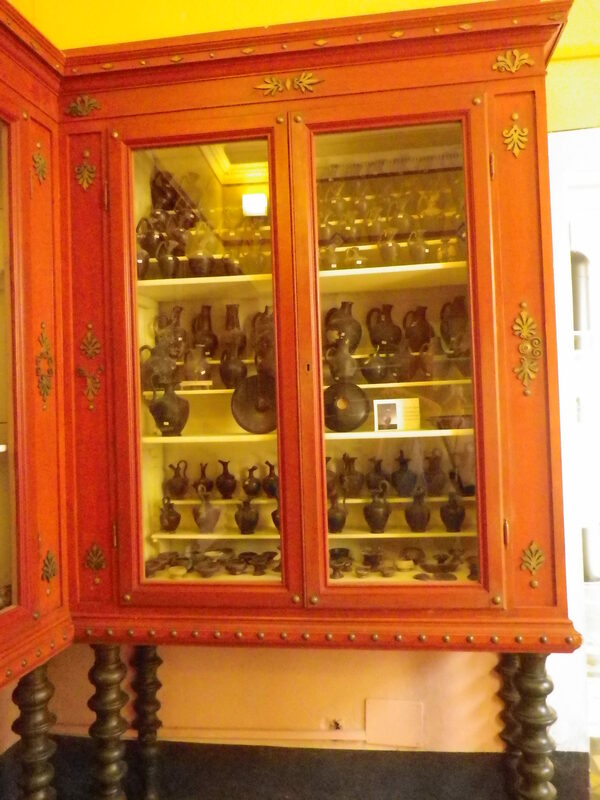 And here are lots and lots of terra cotta vases. There were lots and lots of everything, in fact. This museum may have had a great collection, but it was exhibited without much art. Here are some little animals – look closely and you’ll see that one of them has fallen over. How long ago? Some of the object were quite oddly displayed. Here were two funerary urns placed behind a rectangular hole in the wall. If you peered inside, you could see the second one, but otherwise not. What was that all about? 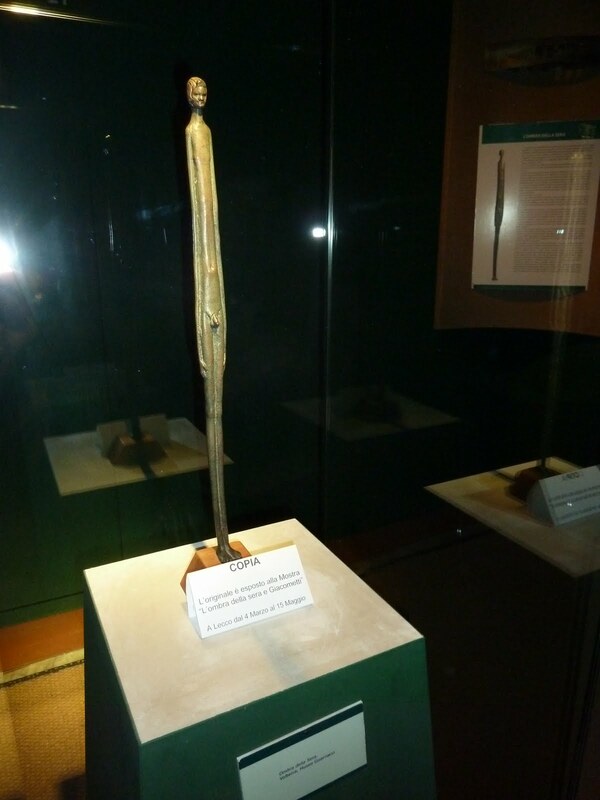 Still, there were some objects that really gave a sense of the culture. 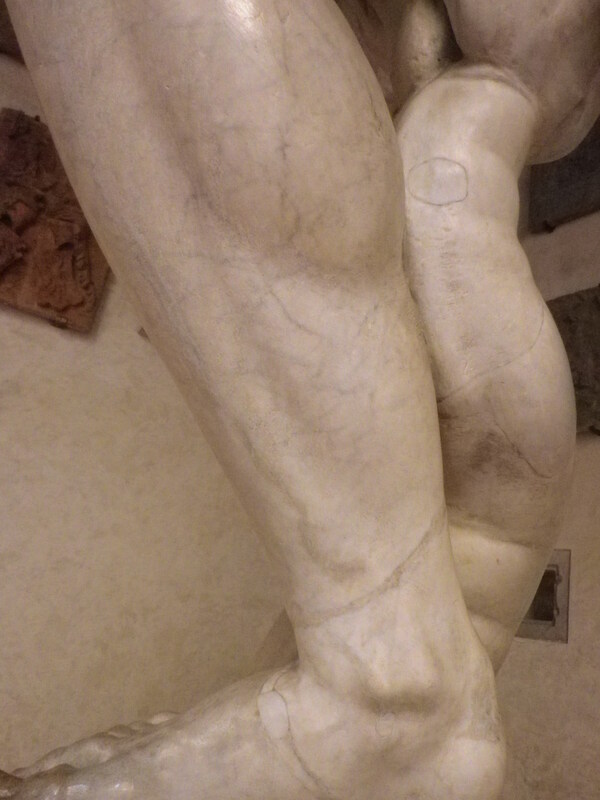 The funerary urns with their all too human statuary were very appealing. Best of all was the famous Shadow of Night statuette. Since there is currently an exhibit in Paris called “Giacometti and the Etruscans,” this was on loan and we were actually looking at a copy. 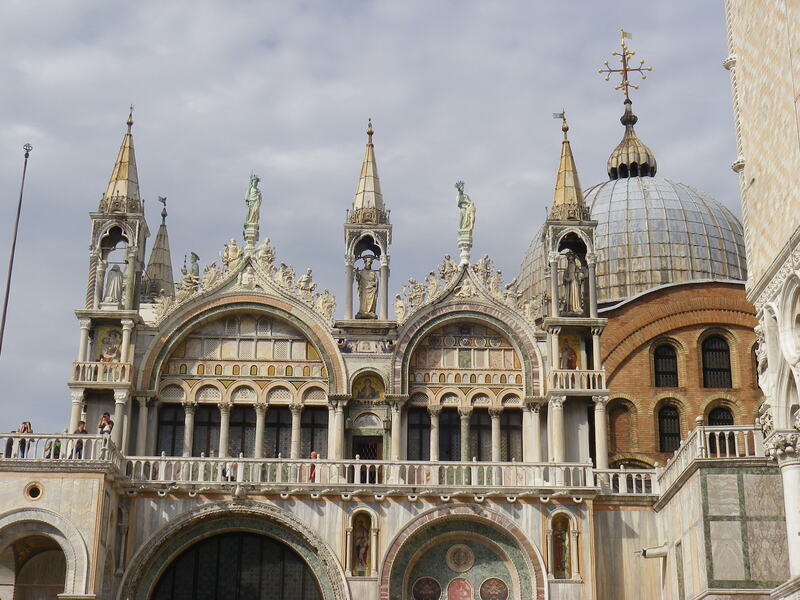 Oh, well, it was still quite wonderful and clearly must have influenced Giacometti, who saw it here in the 1960s. 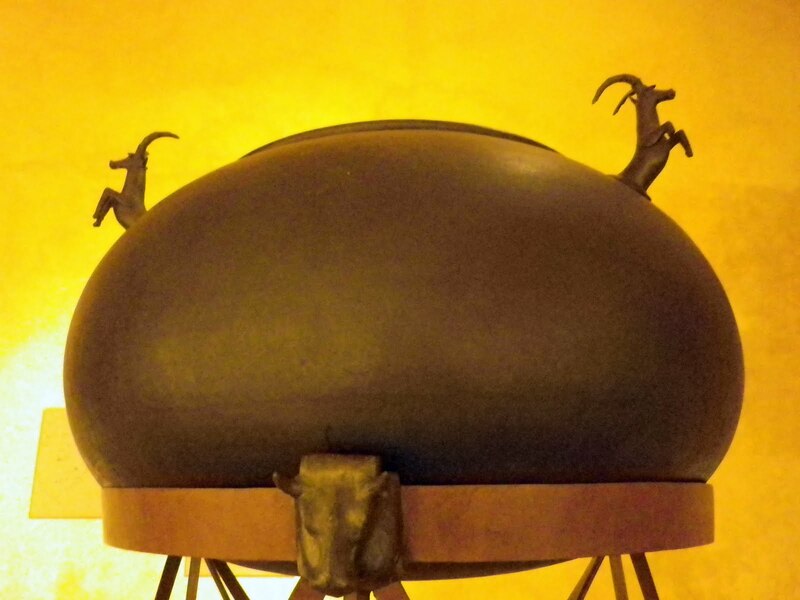 Cortona has an Etruscan museum, too, not quite so extensive but much more creatively displayed. Here are some metal pot decorations that caught our eyes. 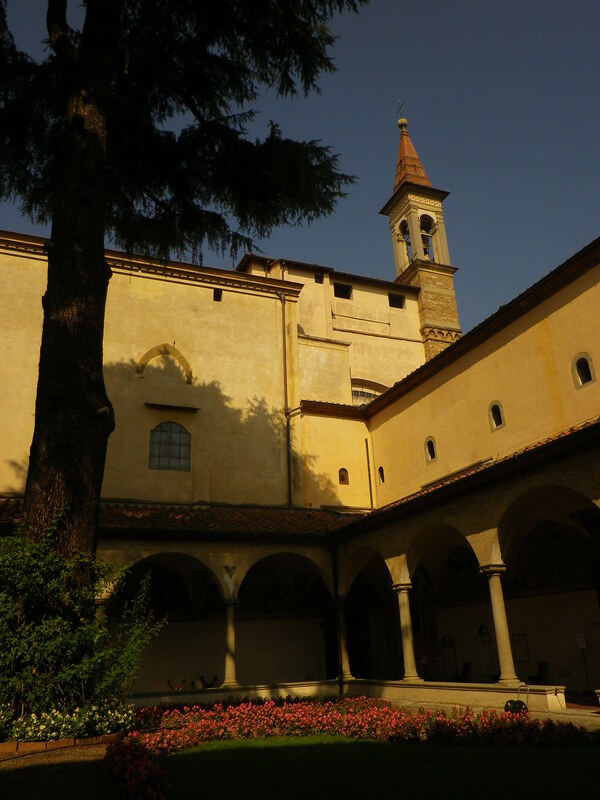 One odd thing about these museums and most others in Italy: once you come to the end, the only way you can leave is by retracing your steps back to the entrance. Hmmm. 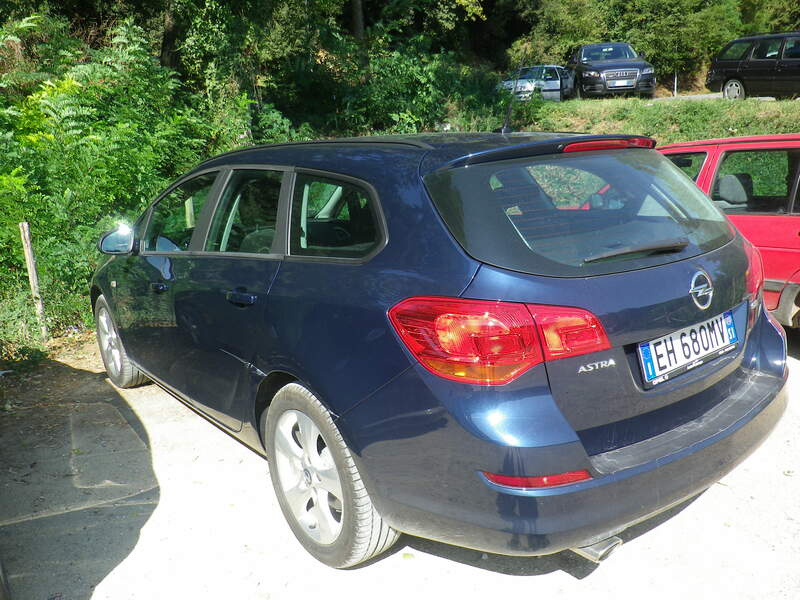 On Monday, we picked up our car, an automatic because of the HILL towns we were planning to visit. A bit molto grosso, but that’s what you get when you ask for the exotic automatic transmission in Europe, and it served us quite well. (We had to take its picture so we could find it again in the parking lot.) 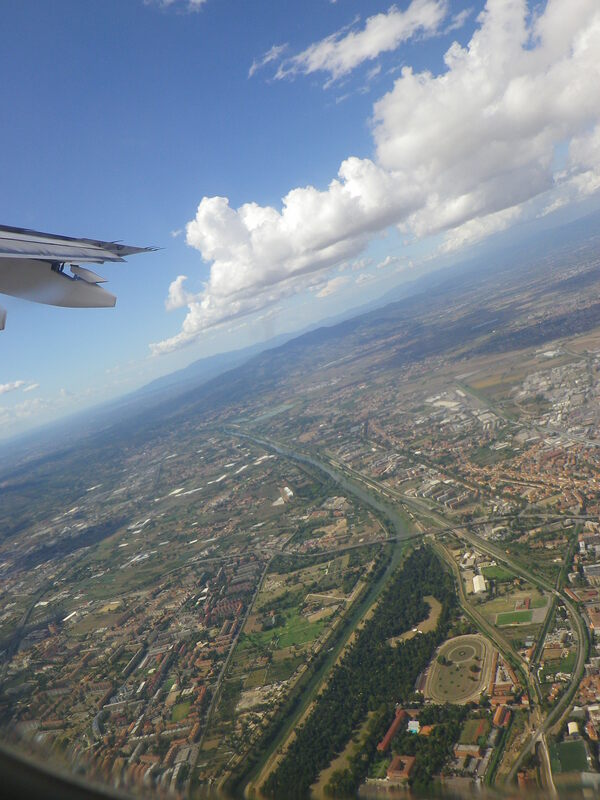 We were equipped with an atlas of Tuscany, a map of Siena from the B&B, another map of Siena from the Avis office, and Alison’s map of Tuscany, plus some Google maps directions that I sent to Alison’s phone. Even so, we found that the route numbers on the maps rarely matched the route numbers on the roads. The best way to navigate was to determine the next town and look for signs. We asked directions a few times, too, and people were quite helpful. You need to know sinestra (left), destra (right) and diritto (straight ahead), and you’ll manage just fine. 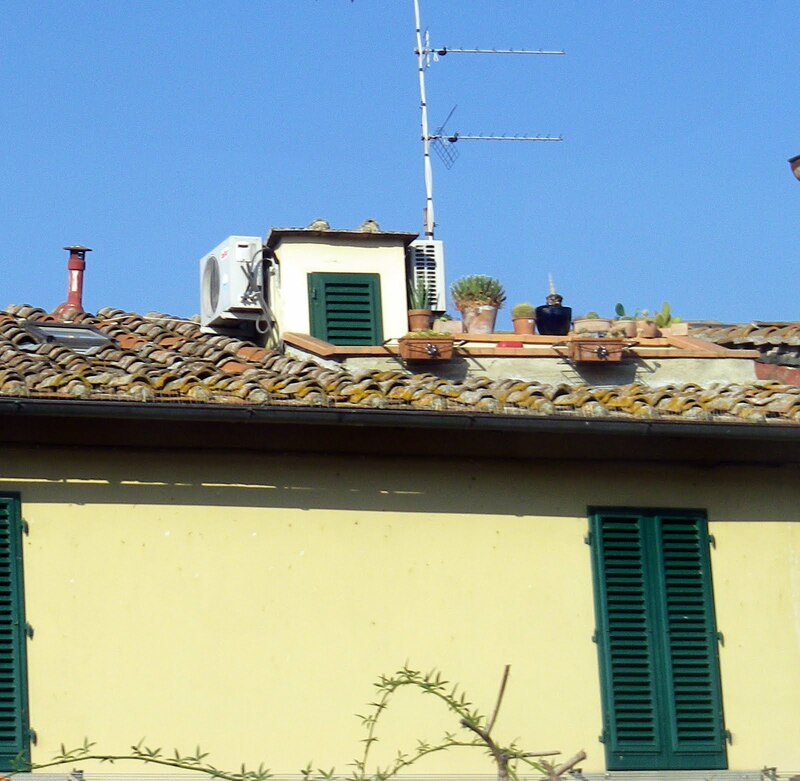 Once we got out of town, always interesting in a foreign city, we were soon on a boring but safe divided highway and made our way to Volterra (Monday), Cortona (Tuesday) and Montalcino (Wednesday). Since hill towns are all unique but all share the same elements, I’m combining them here. You wend your way along the valley floor, looking at the bare hills (did they just harvest sunflowers?? ), grapevines, and olive trees. 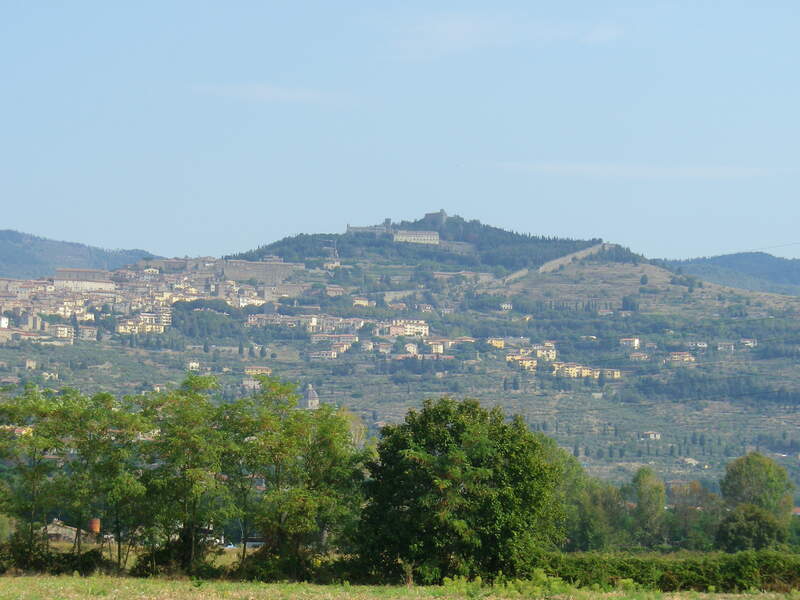 As you approach your destination, you see it looming ahead of you, like this view of Cortona. 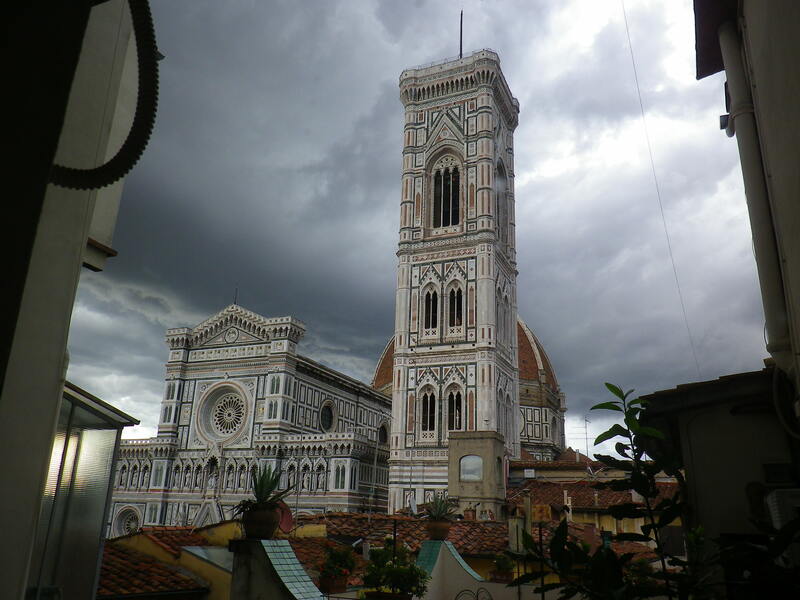 You can see why the feuding Tuscans chose hills for their cities. Then you navigate up hairpin turns, of which I have no pictures because it was all I could do to keep my hands on the wheel and avoid the cars barreling down the hills at a great rate of speed. Some of the approaches were just a bit scary, but if you don’t look over the guard rail you don’t have to know that it’s a sheer drop to the valley floor. 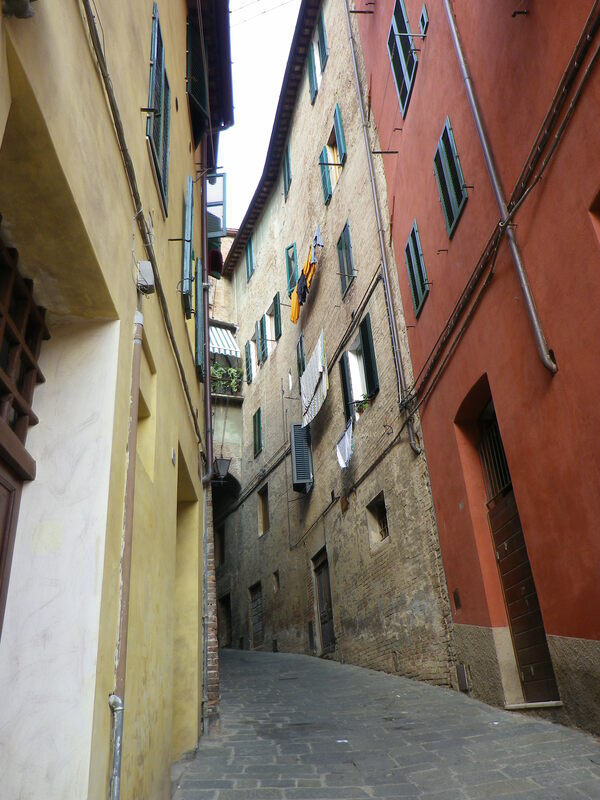 Then you find your way through the narrow streets to one of the several main piazzas in town. 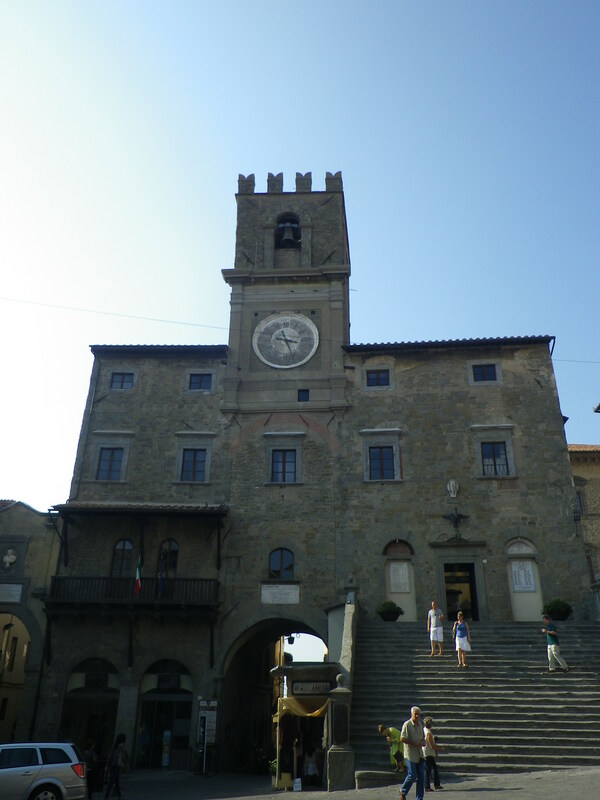 This is the Piazza Pubblico in Cortona, with its imposing town hall. 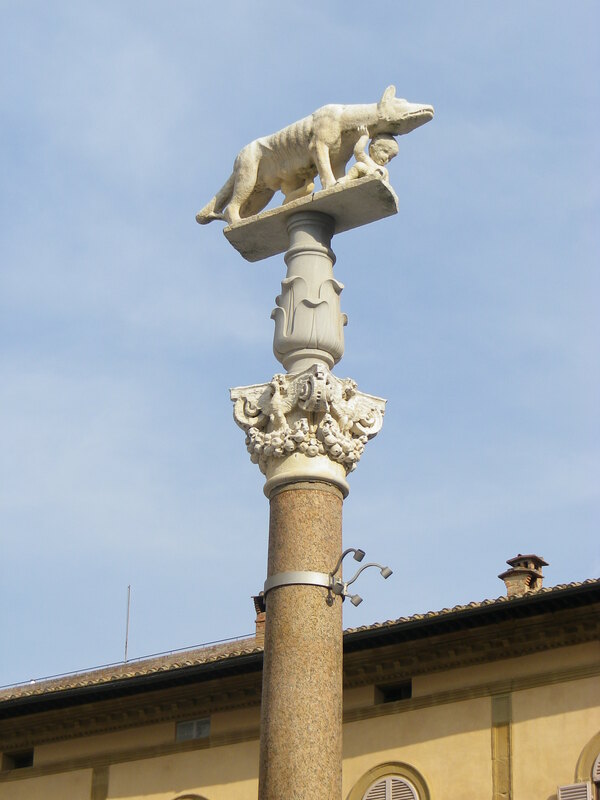 As in Siena, these often include a civic museum. 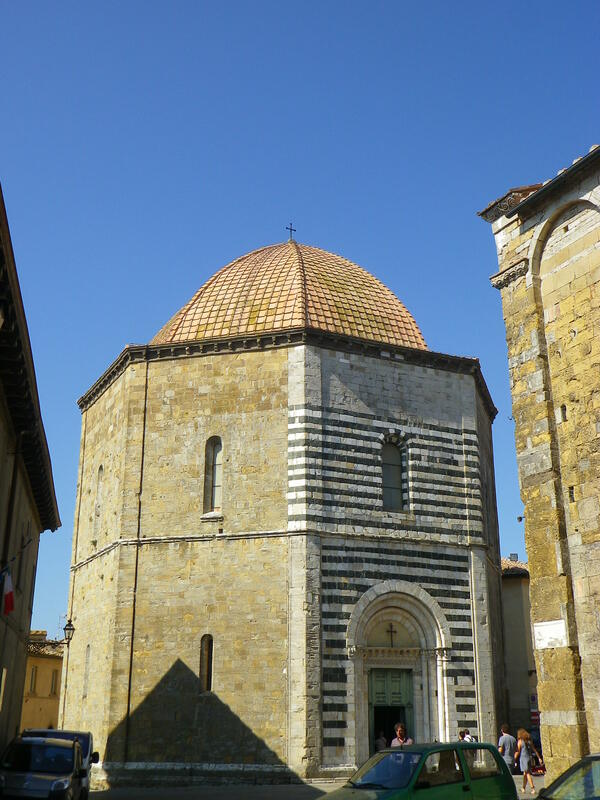 There is also usually a Baptistery, octagonal of course, often faced with marble like this one in Volterra. And, of course, a cathedral. 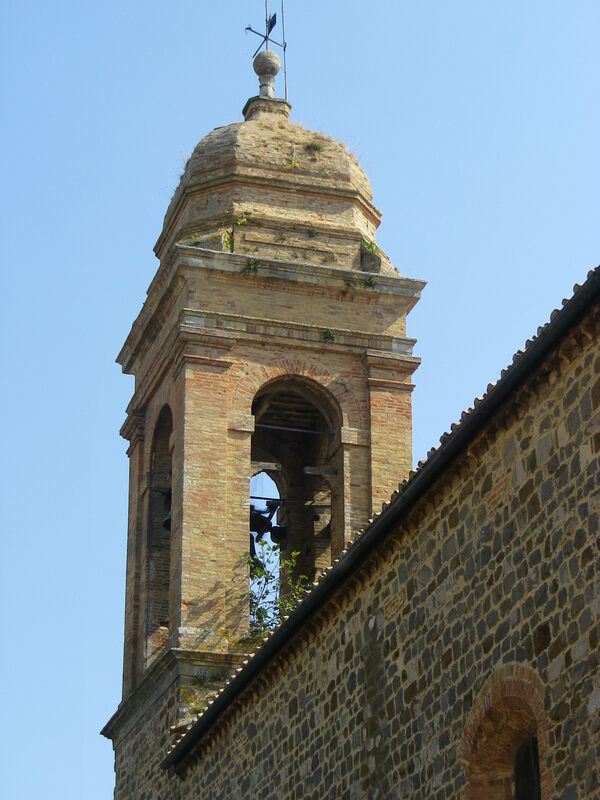 The one in Montalcino had a small tree growing in its campanile (bell tower). 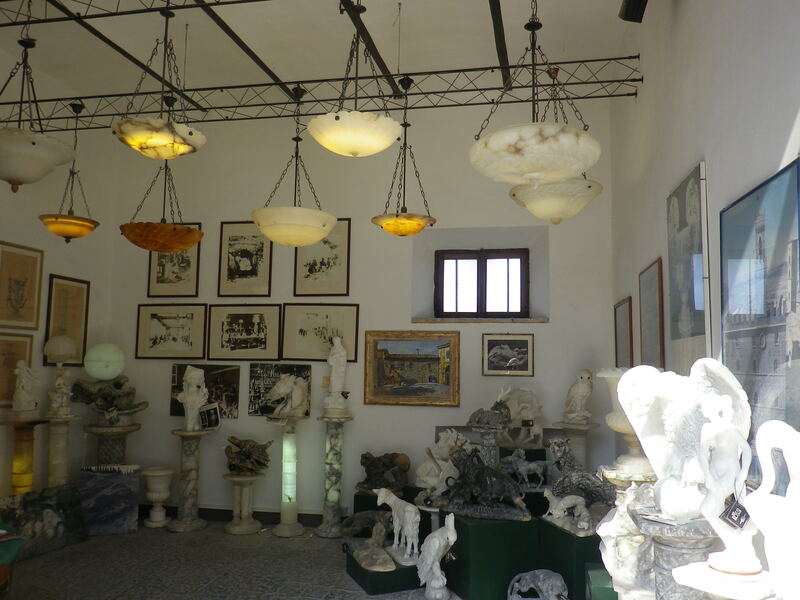 We were still in search of ART, and we saw some great things in Volterra and Cortona. 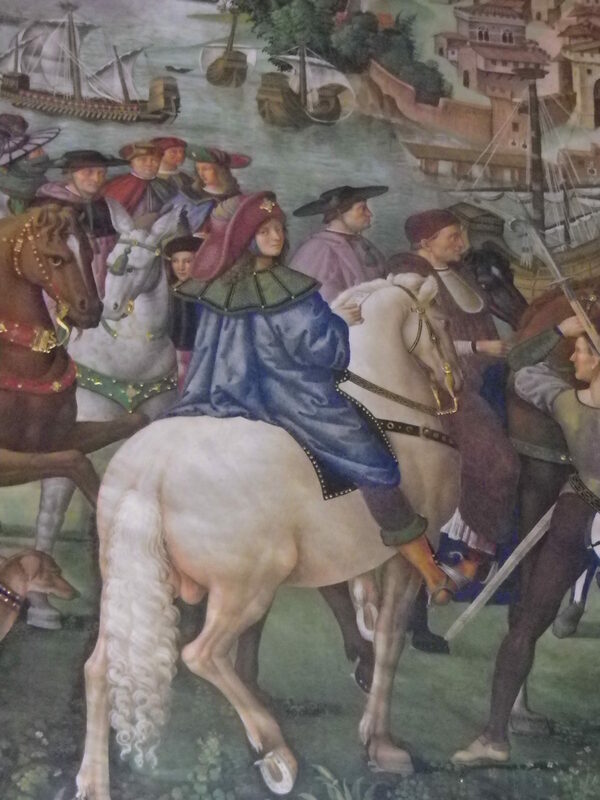 I must confess that, by Montalcino, we were all wore out and didn’t set foot in a single museum or religious institution. 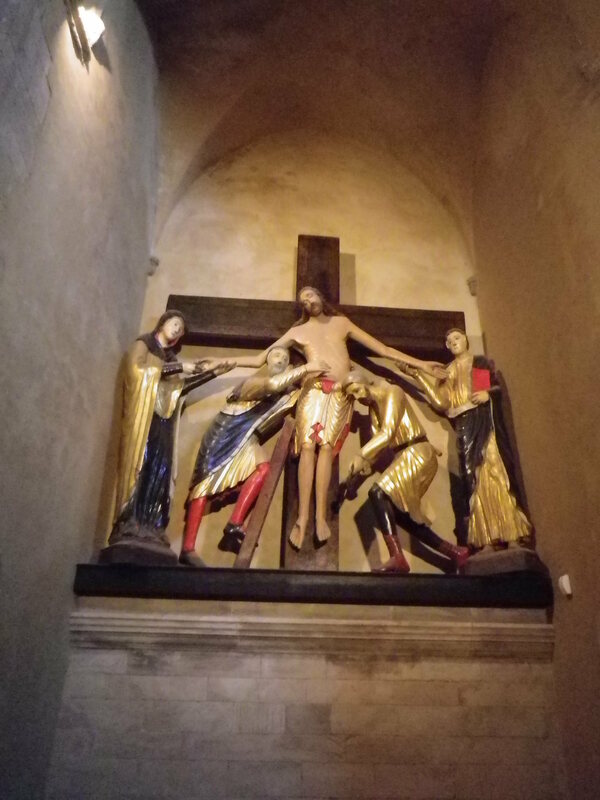 But first, we saw this thirteenth century deposition of Christ in Volterra. We paid 50p to have the light turned on so we could see it clearly for three minutes. 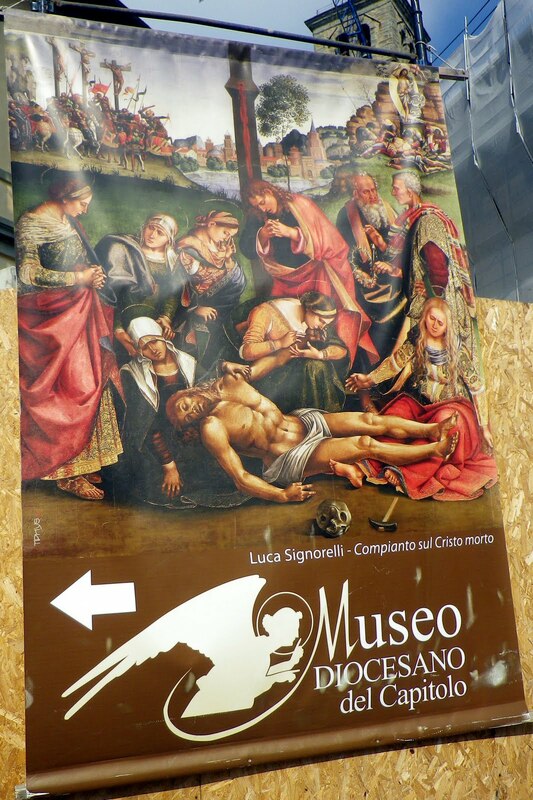 The Diocesan Museum in Cortona is known for its art by local Luca Signorelli, whom Frances Mayes adores but we found a bit melodramatic. 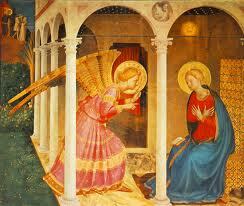 Both of us much preferred Fran Angelico’s Annunciation, also here. 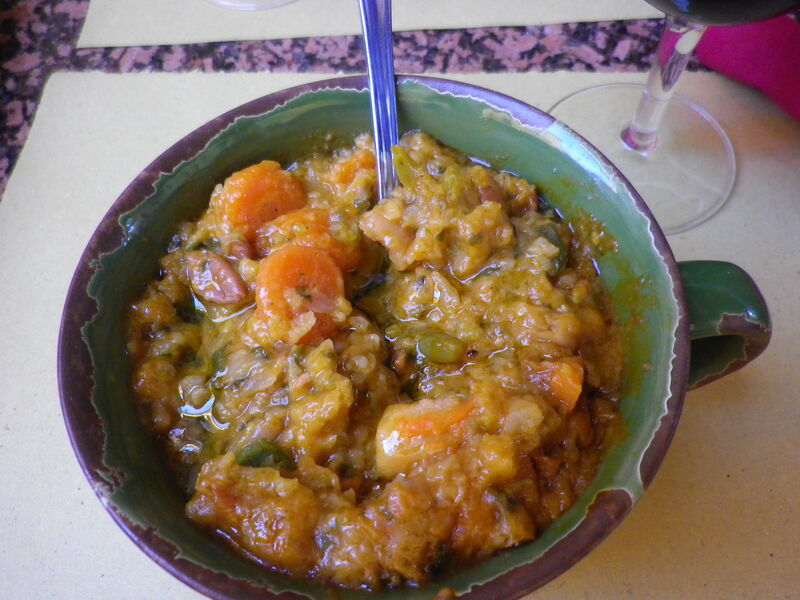 Then, of course, there is lunch. 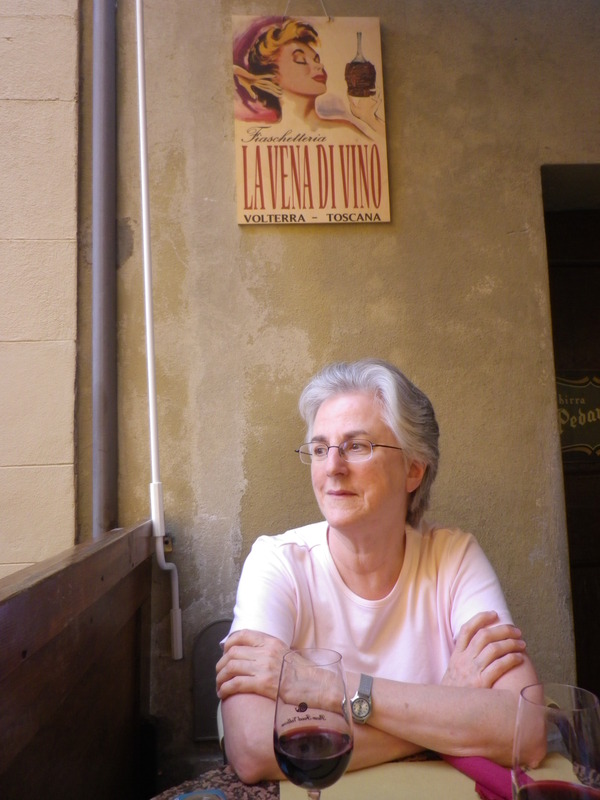 In Volterra, we went to a hole in the wall recommended by Rick Steves and enjoyed it mightily. 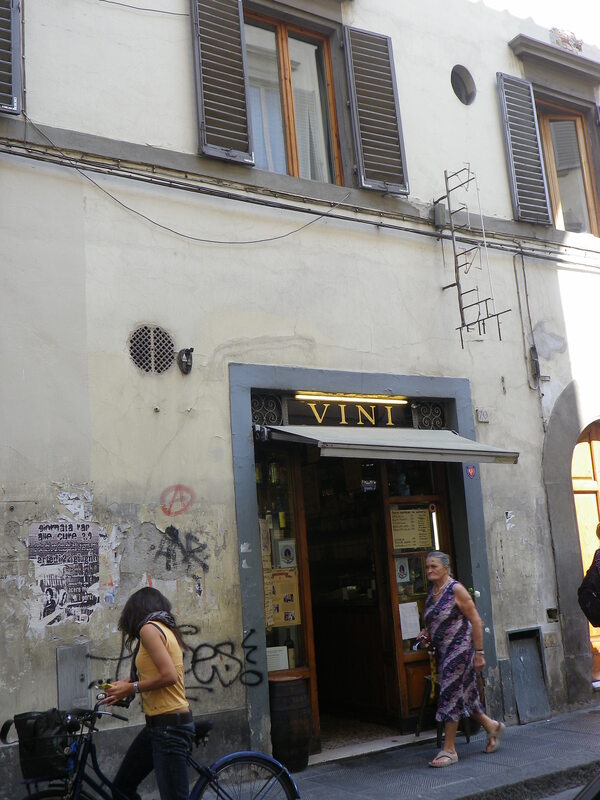 La Vena di Vino had a nice red wine and delicious zuppe de pane, the local equivalent of ribbolitta. 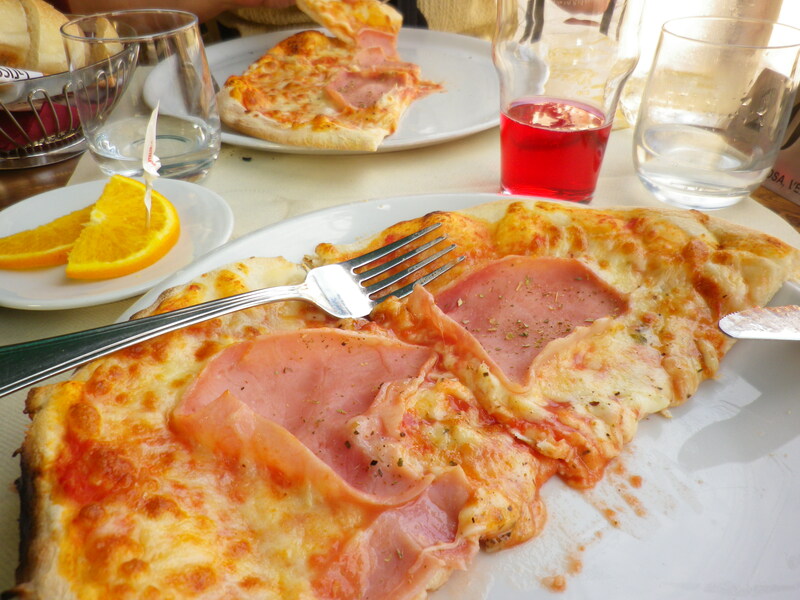 In Cortona, we had delicious melone e prosciutto, so perfectly ripe and delicious that it must be the food of the gods, followed by thin crust pizzas. 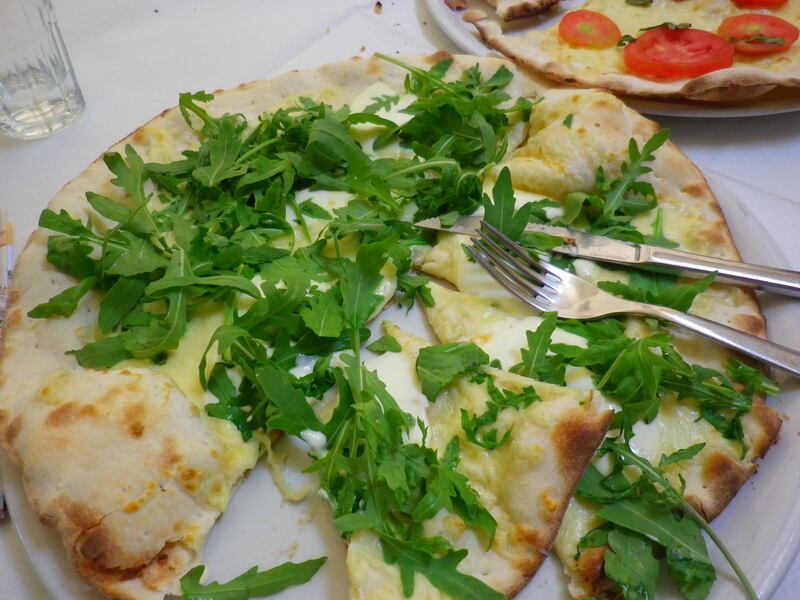 Mine had rocket (arugula) and stracchino. 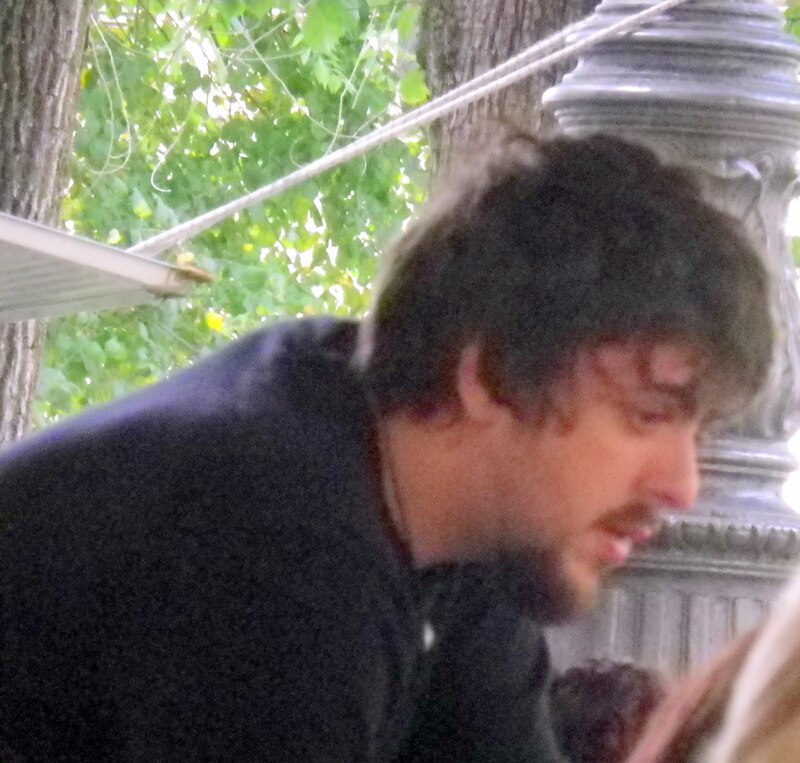 In a fit of snobbery, we were somewhat appalled when a group of loud Americans plopped down and proceeded to order cheeseburgers, French fries and diet Coke. 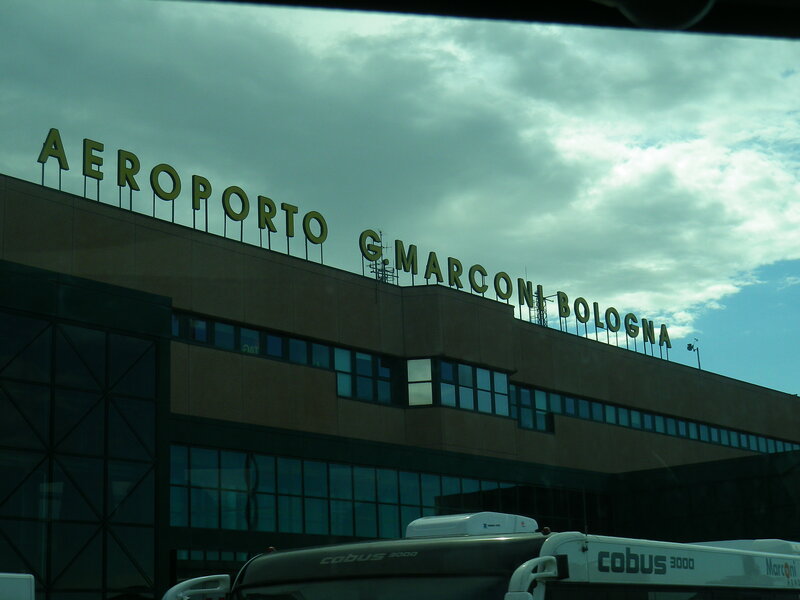 IN ITALY! What is the point?? 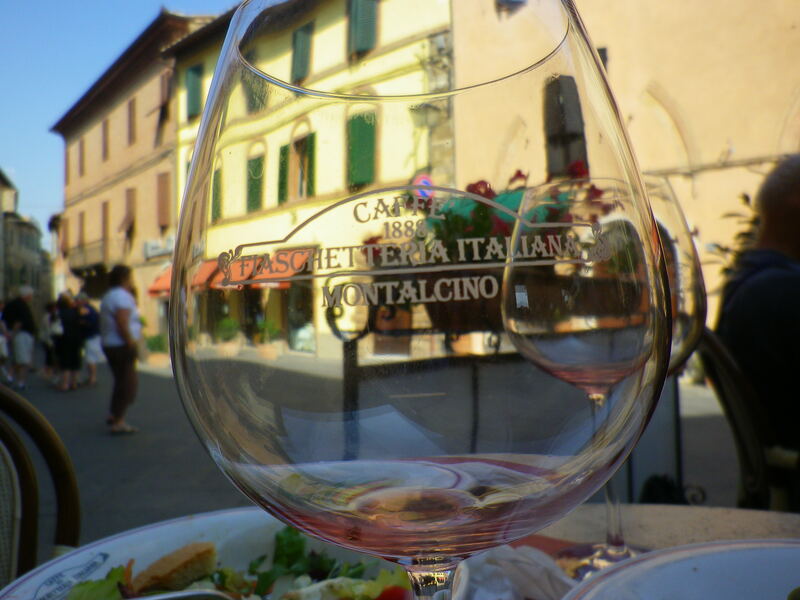 And in Montalcino, which is all about wine, we had indifferent salads and antipasto accompanied by a glass of quite good Brunello. Next: the Etruscans.